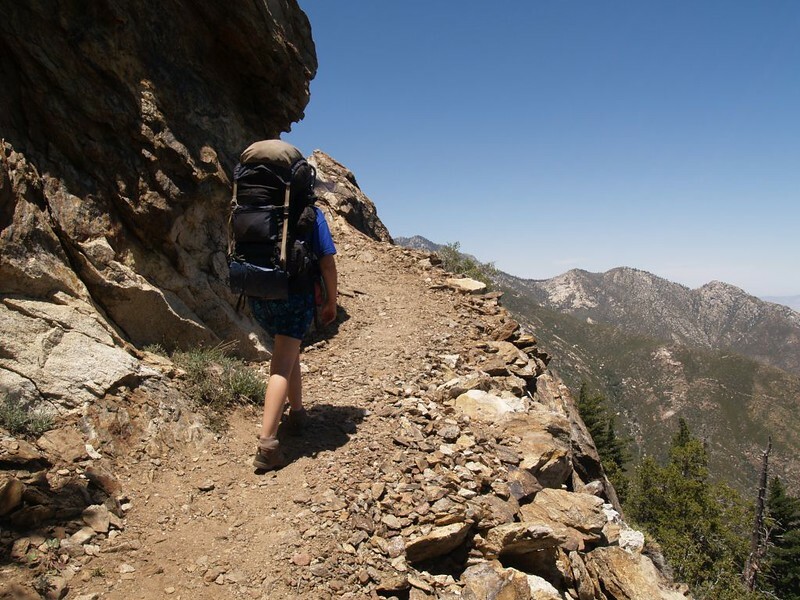 Vicki and I hiked the Pacific Crest Trail (PCT) from Route 74 in Anza to Humber Park in Idyllwild (PCT mile 152 to 179) on Memorial Day Weekend in 2013. 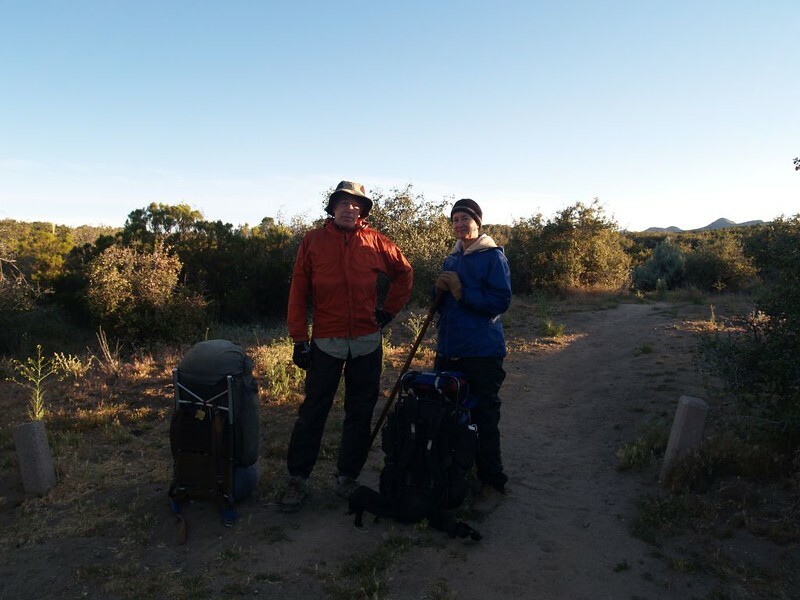 It was a 30 mile hike which took us four days and three nights. 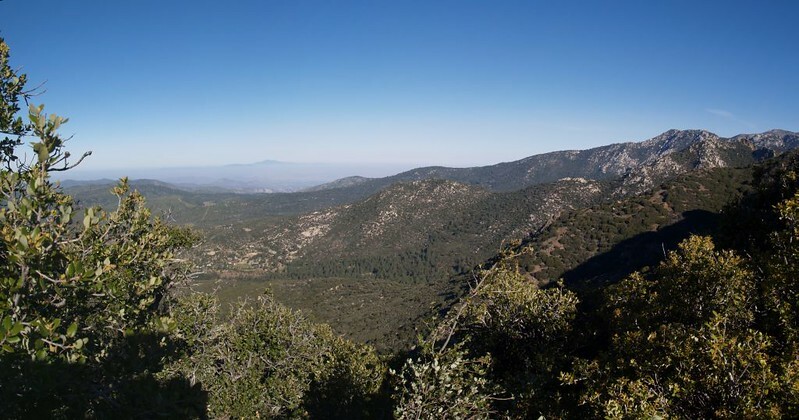 On this particular hike, the location of water sources plays a huge role, so our original plan was to hike three easy five mile days and a grueling fifteen mile day, camping at Live Oak Spring, Cedar Spring, and Apache Spring. But weather concerns (and an offer to give a friend, Hikin’ Jim, a lift back to his car) made us change the hike to a ten-five-ten-five miler, thus skipping Live Oak Spring entirely, and sleeping the final night away from water (meaning that we had to carry more water with us on that ten mile day). And that’s what we did. 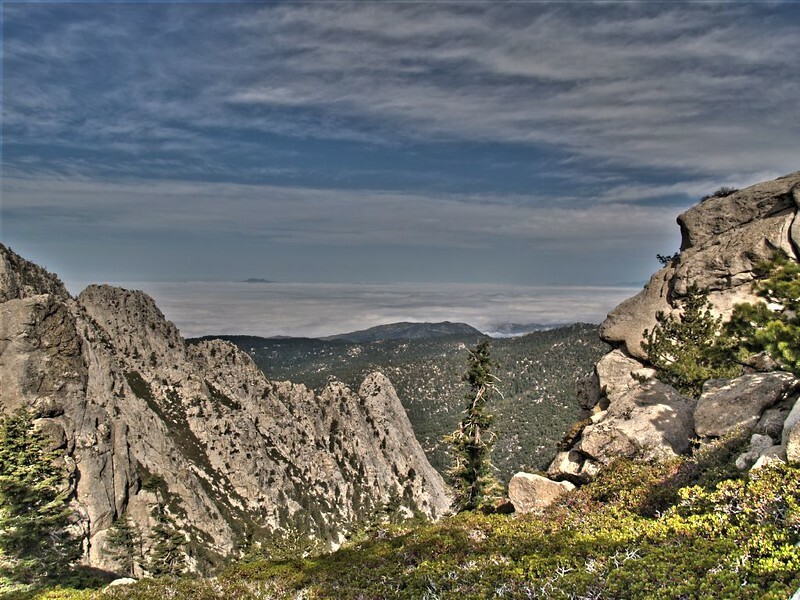 As you look at the photos, you’ll see that the PCT lives up to its name, as we stayed on or near the crest of the San Jacinto massif the entire time. Lots of climbing, but also lots and lots of views. 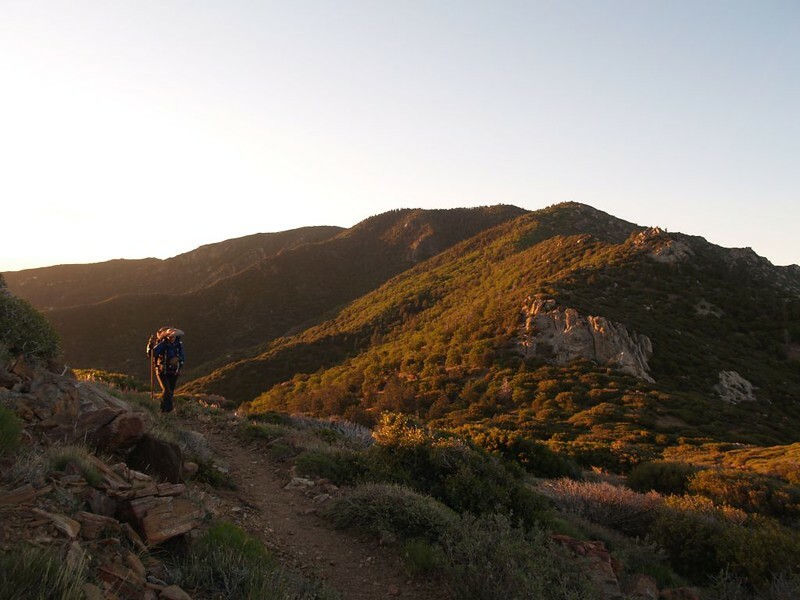 That’s what the PCT is all about. 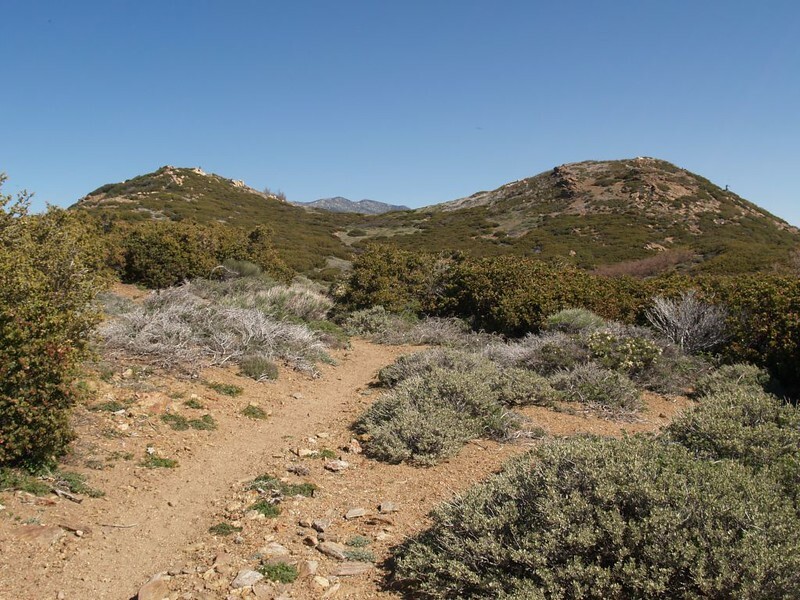 The early part of the hike climbs up out of the high desert, and the vegetation is mostly scrubby chaparral with patches of oaks and the occasional pine tree. It was fairly hot in the sun, so we hiked slowly and took rests. 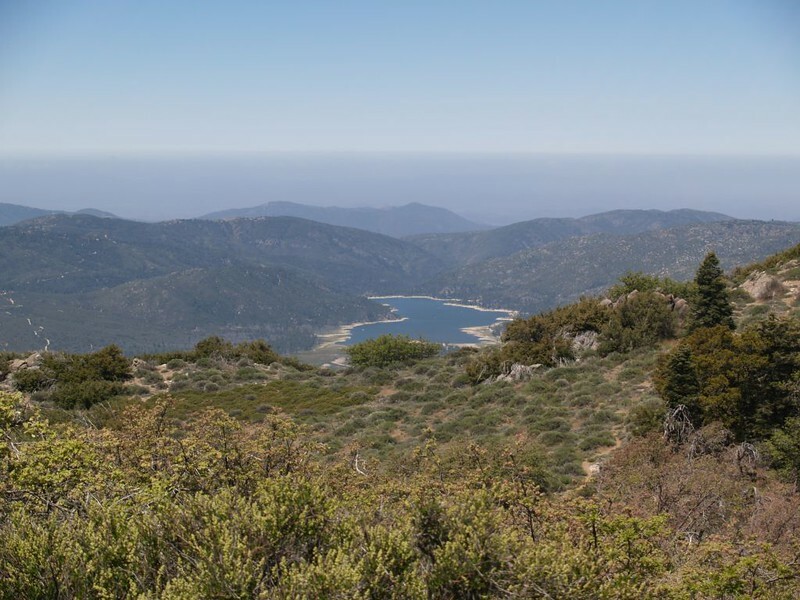 The later part of the hike was at a much higher elevation, with more oaks and pine forest, and the climbing made us hot, so we hiked slowly and took rests. This seems to be our hiking style, I’m afraid: Slow and restful. But at least it leaves plenty of time to take pictures! Our son helped us out by driving along with us. We left our car at the terminus in Idyllwild and then he drove us back to the trailhead and dropped us off with only our packs. At that point we basically had no choice but to hike the entire thirty miles if we ever wanted to see our car again! 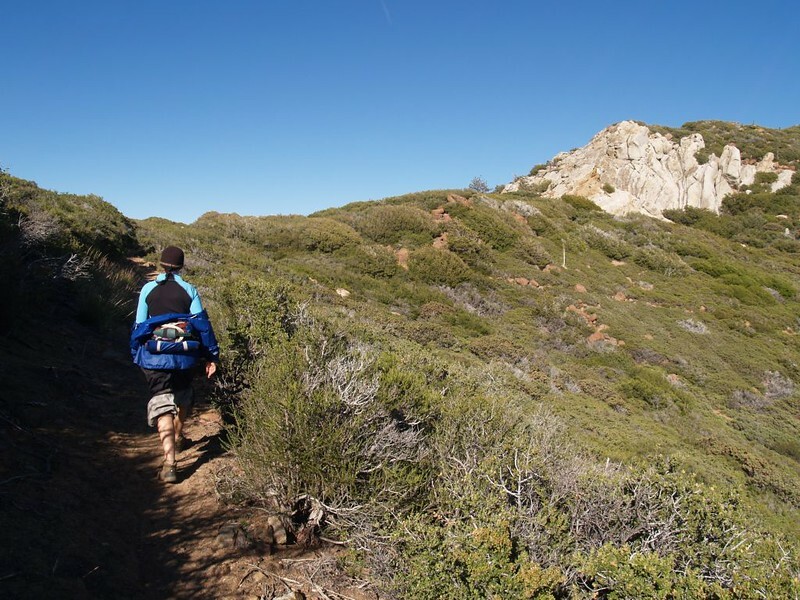 The first part of the day’s hike was to travel through Penrod Canyon, eventually attaining the Pacific Crest itself. 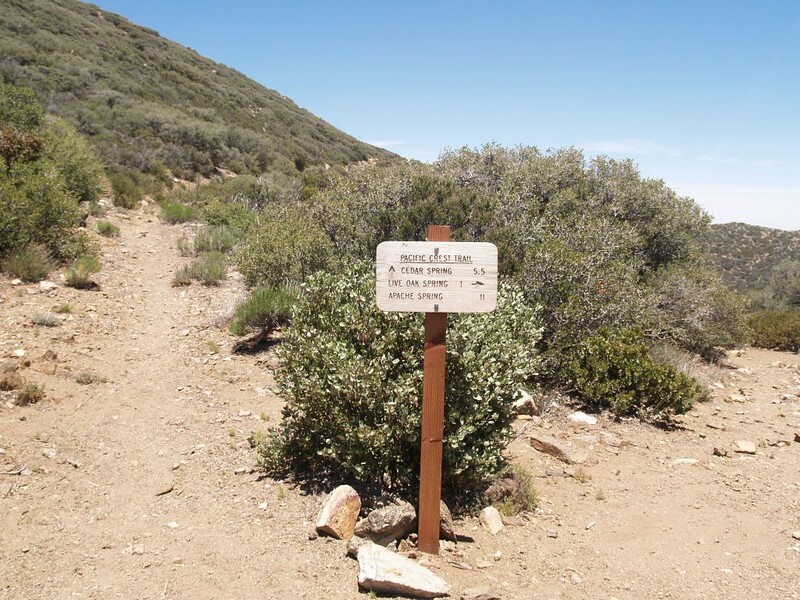 This part of the the trail went up and down quite a bit, avoiding private property and inconvenient hilltops, until the final stretch when it ascended continuously to the saddle on the crest. It was hot out there in the sun, and we took advantage of any shade we could find. 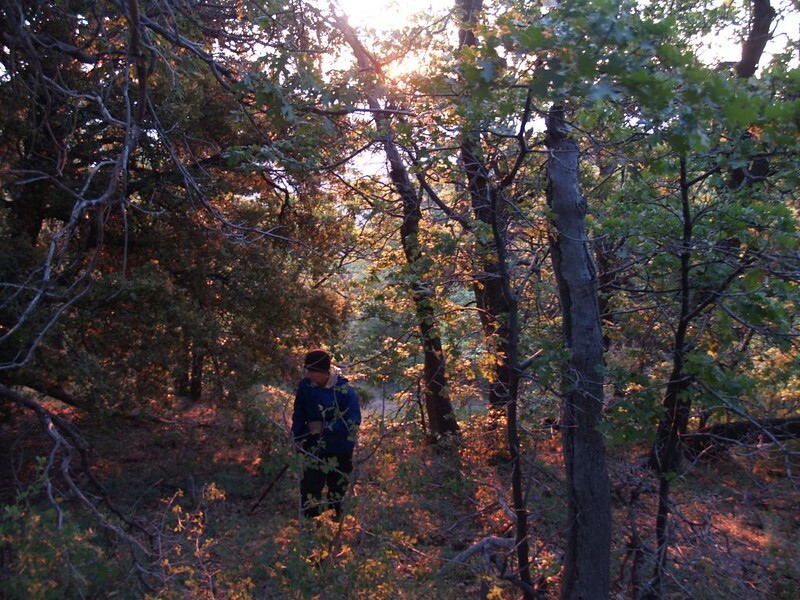 Not far beyond the saddle was the trail to Live Oak Spring. 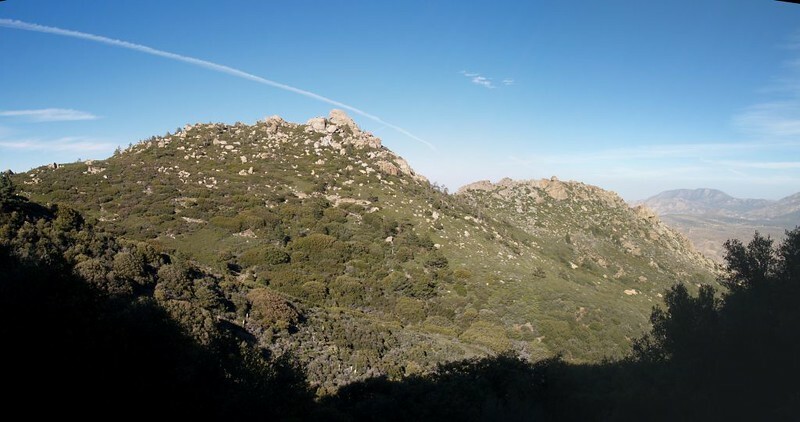 The spring itself was nearly a mile (plus a 500 foot elevation drop) down a side-trail, and that was where we had originally planned to stay the night (on the 5-5-5-15 mile plan). This was less than optimal, but we were at the point where the big decision had to be made. I really wanted to push on to Cedar Spring (the 10-5-10-5 mile plan). 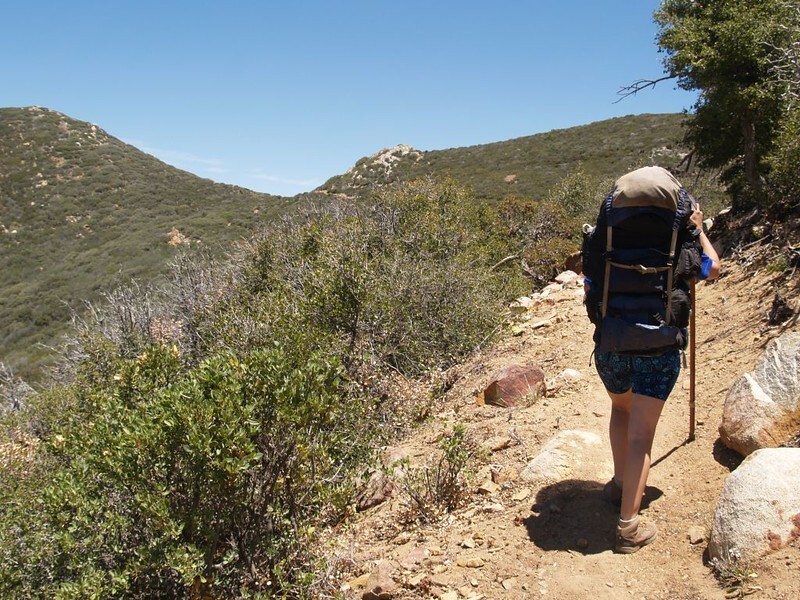 Vicki was exhausted, so she didn’t want to hike another five miles, but she also didn’t want to lose 500 feet of her hard-won elevation gain. We decided, since it was about one o’clock in the afternoon, that we would have lunch and a rest, and see how we felt afterward. In other words, we made a decision not to make a decision. Great. After a relaxing nap, Vicki decided that she might be able to make it to Cedar Spring after all. At least she’d try. And what more could I ask for? So we shouldered our packs and climbed on. 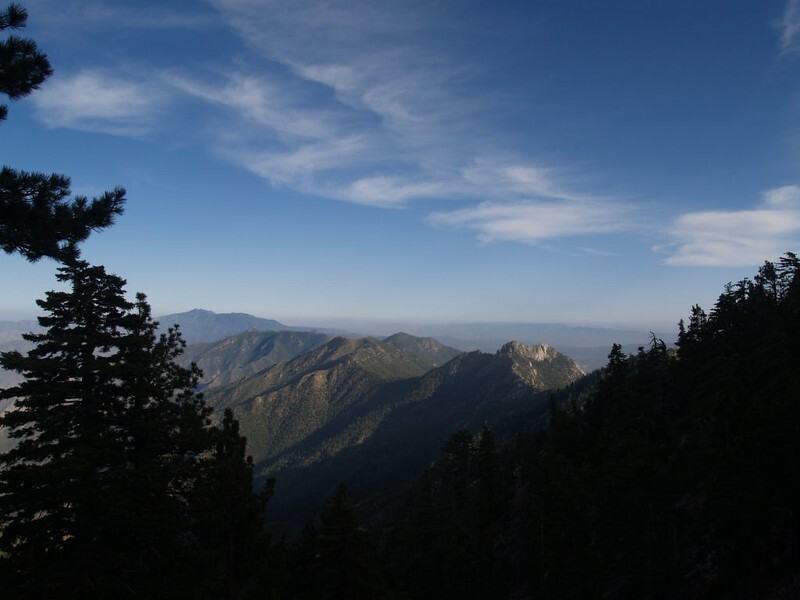 For the next five miles we would be hiking right along the Pacific Crest, so the views were continuously excellent. I took lots of pictures. 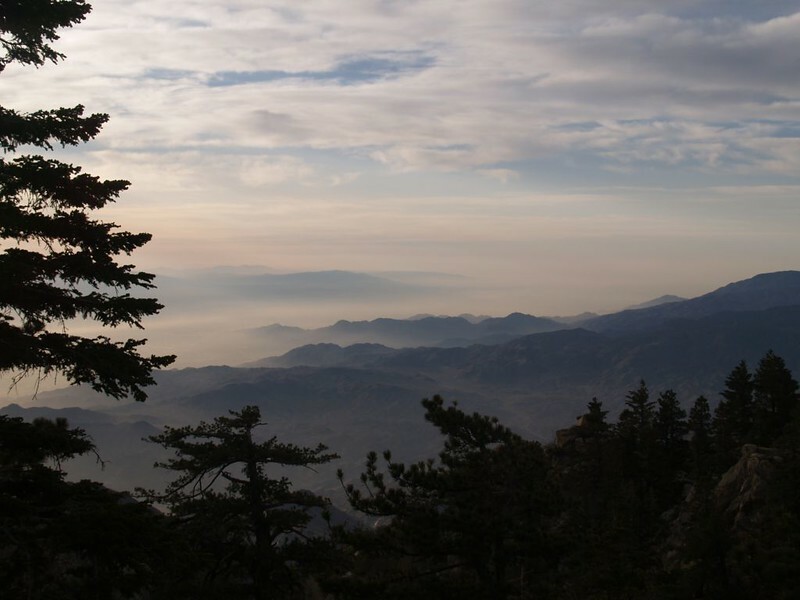 At times we would have great views east into the desert of the Coachella Valley, and at other times we’d be looking west, or north, or south. It was beautiful. We passed by a number of individual peaks that were protruding from this twenty-mile-long ridge. If we had had more energy, or more time, or more desire to bag peaks, we would have climbed them. 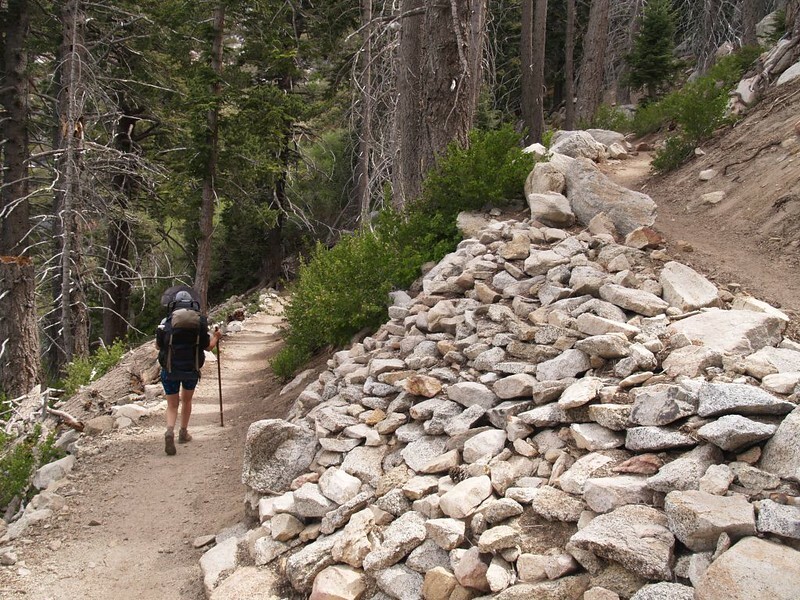 As it was, we were happy that the trail stayed below their summits, conveniently traversing around them. 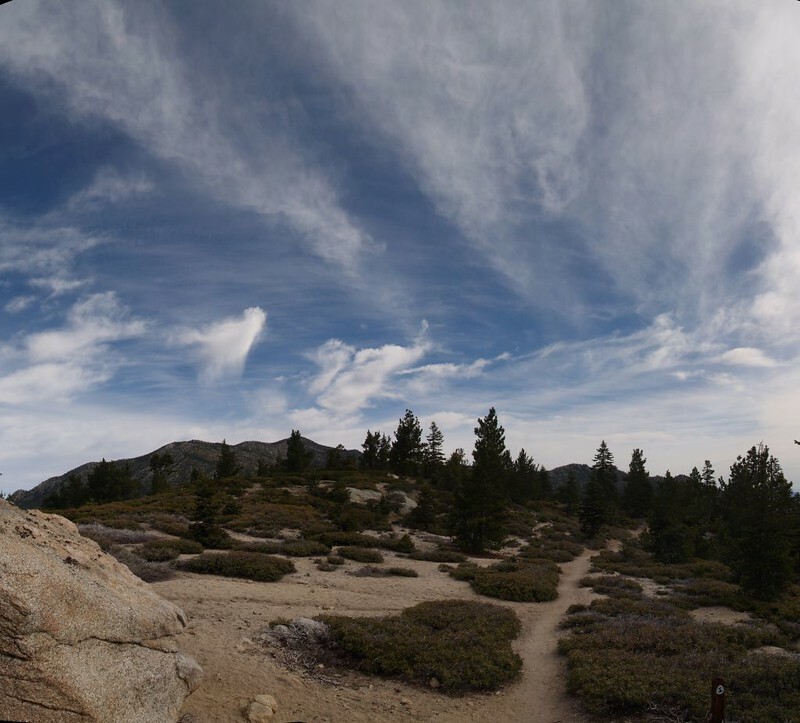 Video of a windy ridgeline near peak 6868 (Little Desert) on the PCT. The wind was strong up there on the ridge, and had been getting stronger all afternoon. 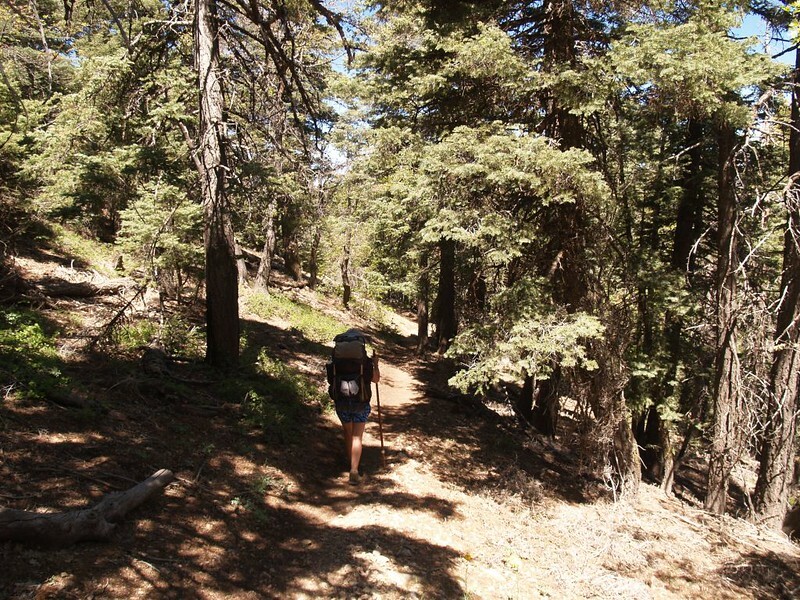 By the time we reached the trail to Cedar Spring, Vicki was exhausted. 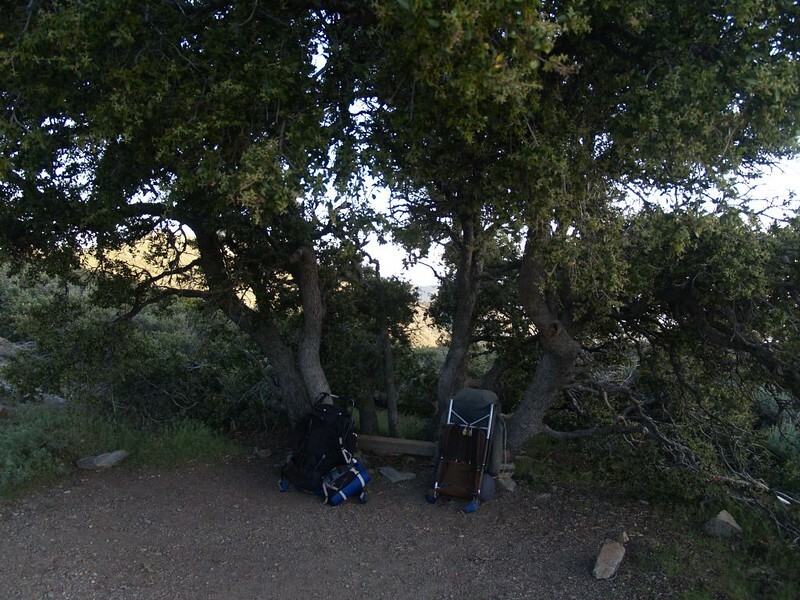 We took off our packs by a lovely bench protected by some hardy oak trees, and contemplated where we wanted to camp. Judging by Vicki’s condition, I wanted to camp right there, but technically it was too close to the trail (OK, I’ll admit that it was practically ON the trail). 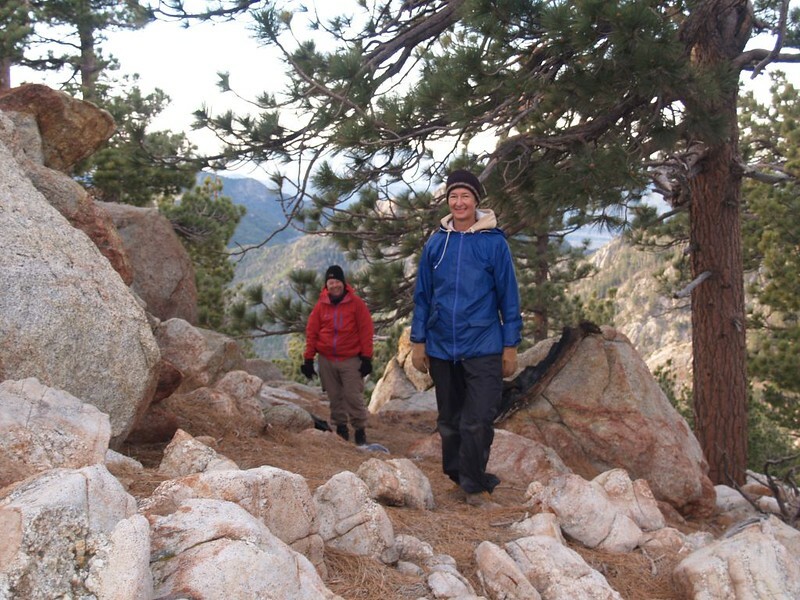 Vicki didn’t want to hike another mile (losing 300 feet of elevation), but she wouldn’t break any rules. Plus, the wind would have made for a miserable night’s sleep. 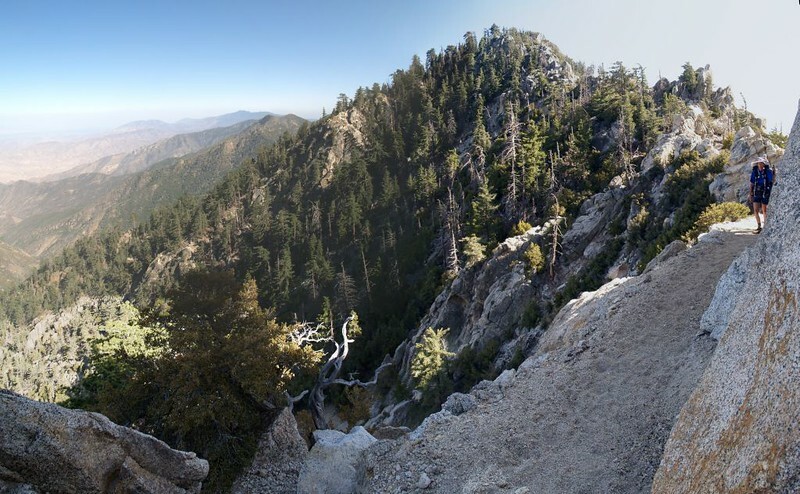 So we compromised by hiking down the trail to Cedar Spring, looking for any possible camping spot along the way. And we found one, about a third of a mile down the path. It had a bit more slope than we preferred, but it was protected from the wind by some oaks, and was just far enough off the trail to be legal. We set up camp, Vicki took a nap in the tent, and I checked out our water supply. It was low. We had enough water for dinner, but not breakfast. So we decided to stay where we were. We’d get up early the next morning and worry about water. After her nap, Vicki cooked some dinner, then we ate it and fell sound asleep. It had been a very long day. We woke at the crack of dawn. We packed our breakfast, the cooking gear, the water filter, and all of our water containers in my empty backpack. Our plan was to hike down to the spring, eat breakfast there, fill up on water, and then come back and break camp. 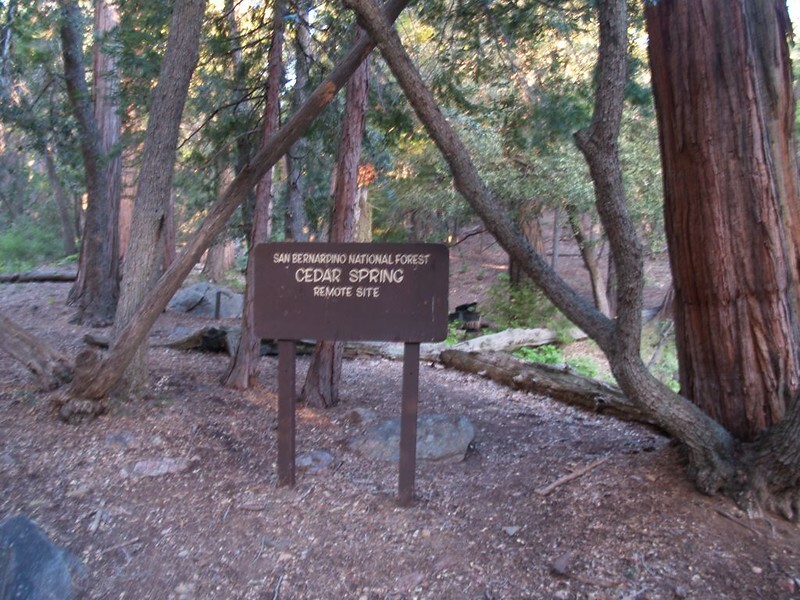 Cedar Spring was a truly beautiful spot, with many places to camp, and huge cedar trees all around. I was wishing that we had camped there, but I didn’t say anything about it to Vicki. She would not have been amused. But she sure did love those giant cedars at the spring. We filtered some water, then retired to an empty campsite to cook breakfast. We spoke with a few other PCT hikers who were just waking up, and generally enjoyed our morning meal. We were in no rush, as we only had five miles to hike that day. All that work the day before was about to pay off. We went back to our camp and got ready to go. 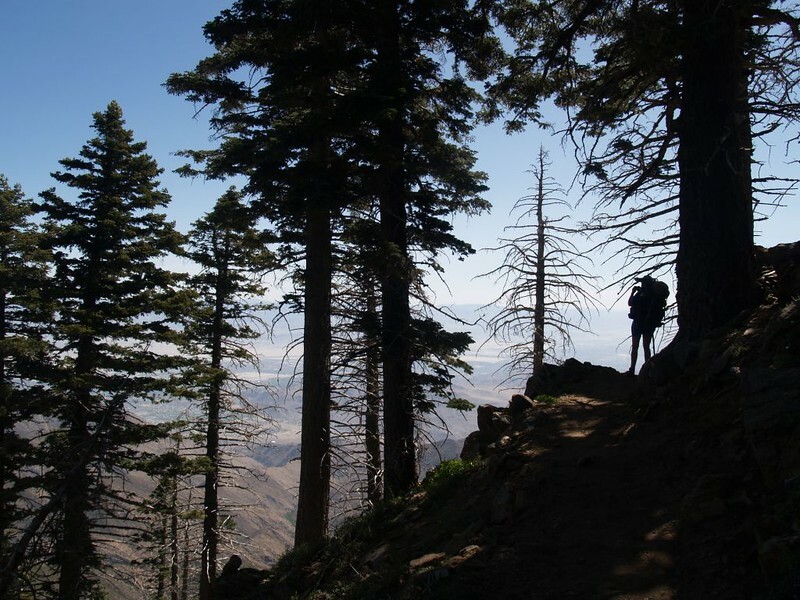 Then we hiked along the PCT, refreshed and happy. 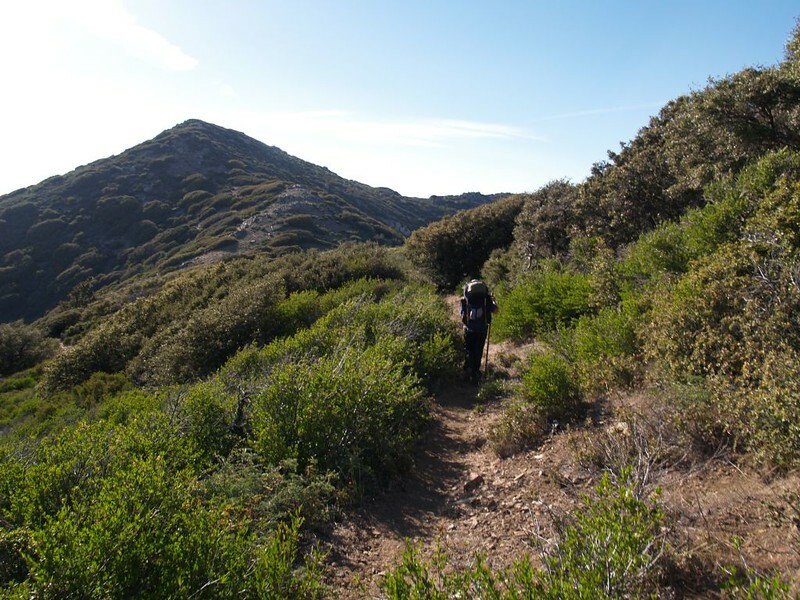 At first we hiked through more of the shadeless chaparral, but eventually the trail climbed high enough to enter patchy forest zones with pines and oaks and oh-so-glorious shade. It was early afternoon when we reached Fobes Saddle, our destination for the day. As is typical, the wind was blowing full blast at the saddle (venturi effect). 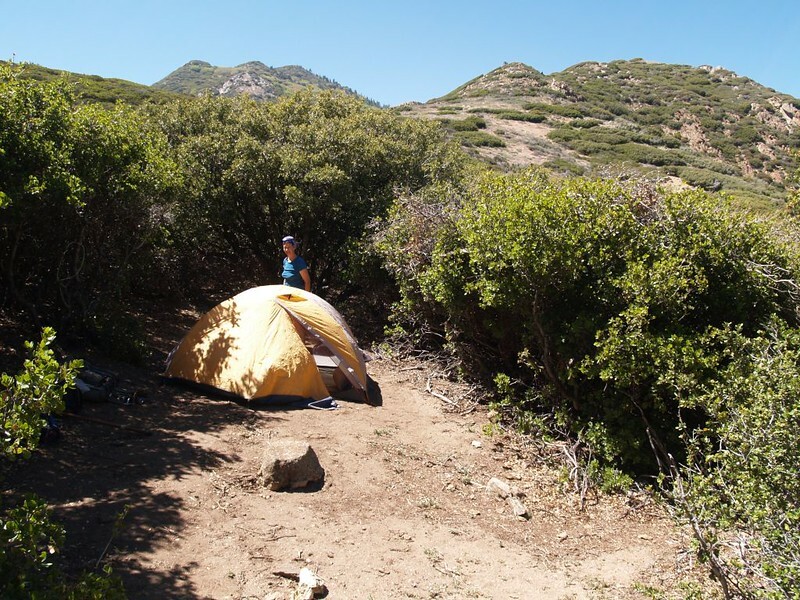 The chaparral was tall, beyond head height, and somebody had created small pockets that were clear of brush, perfect for campsites. We found one of these, nicely sheltered from the wind, and set up camp. 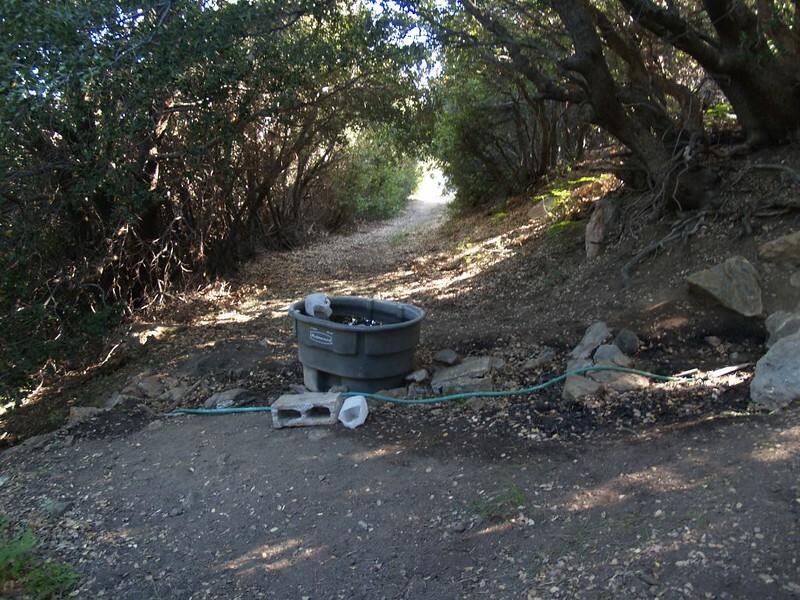 We left a note for Hikin’ Jim on the trail sign, then headed down to the spring at Fobes Ranch to filter as much water as we could carry. It was nice and peaceful down there, with no wind. We wished we would have camped there, except for the fact that we’d have to climb back up to Fobes Saddle with full packs in the morning. That was not part of our plan, as we had a very long day planned for the morrow, and every foot of elevation gained now would be important. 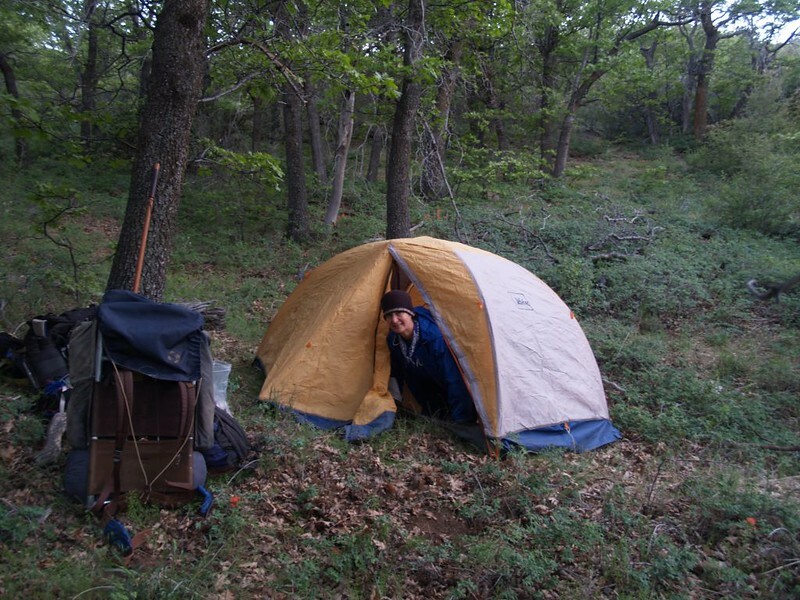 When we got back, we rested in the tent, and then heard some voices nearby over the sound of the wind. It was Hikin’ Jim! We ran out of the tent to say hello, and to meet his hiking partners Will and Kevin. They had spent the last two days bagging all of those nearby peaks that we had been avoiding. Nice job! 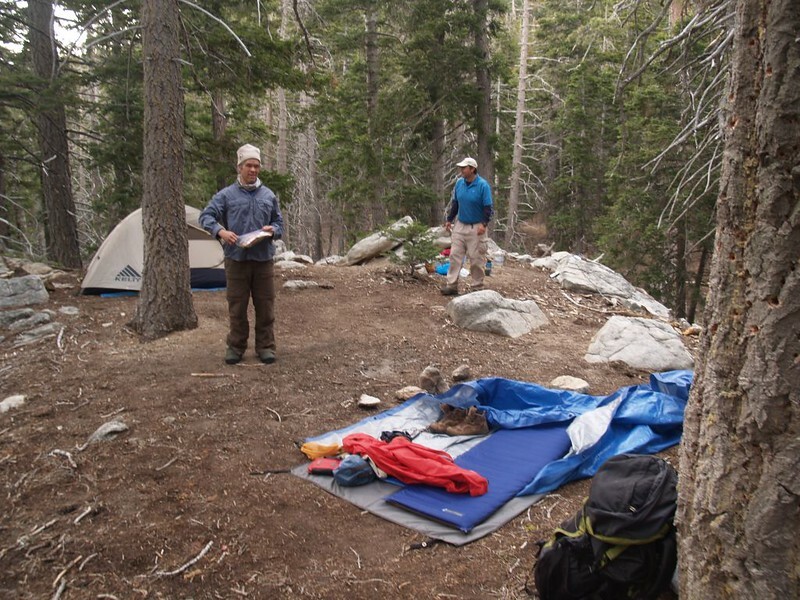 They looked around at the campsites at the saddle, but decided in the end to simply hike down to the spring with all their gear. We bid them goodbye, and we agreed to meet tomorrow at the water cache on Apple Saddle where our trail angel Hal had left three gallons of water for us. Unless they passed us first, of course. All that was left after that was eating dinner and getting to bed early. We planned to wake up at the barest crack of dawn in the morning, in order to get the climb out of Fobes Saddle over with while it was still cool. All that rest proved fruitful, and we woke up super early. 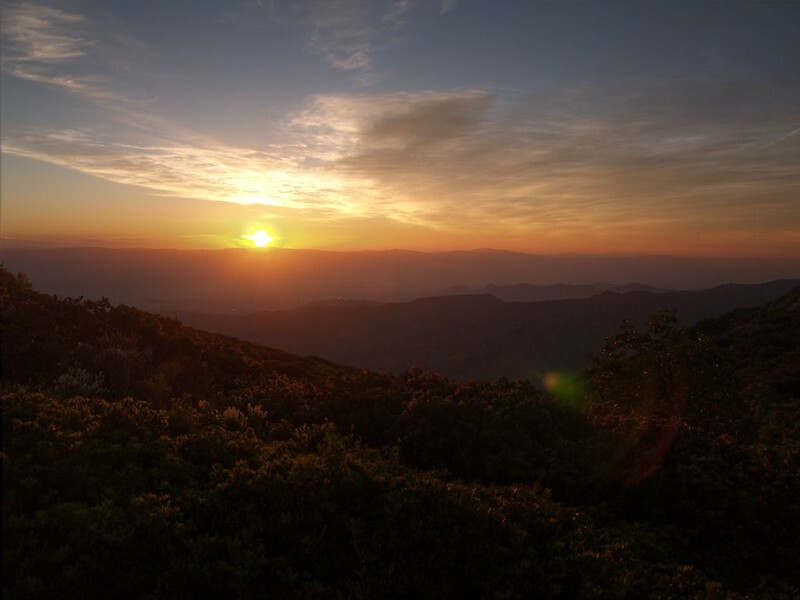 We ate breakfast and packed up our gear before the sun had risen, which was almost a new record for us. Then we started hiking uphill toward Spitler Peak. 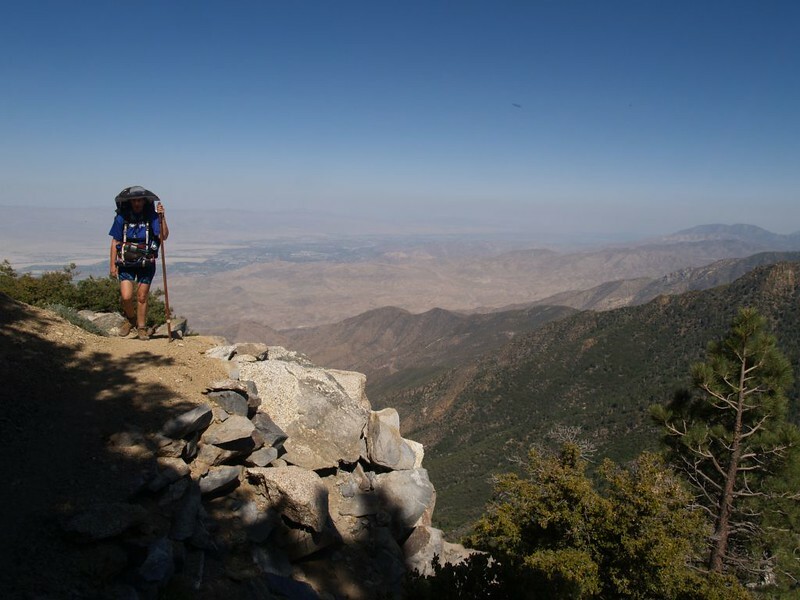 Once again, the PCT was kind enough to get close to the summit and then traverse alongside it. Those who wanted to bag the peak (like Hikin’ Jim et. al.) would have an easier time of it, and those who were lazier (like ourselves) could enjoy most of the views without all of the effort. We made good time in the cool weather, and Vicki still had plenty of energy left as we passed Spitler Peak and headed onward to Apache Peak. 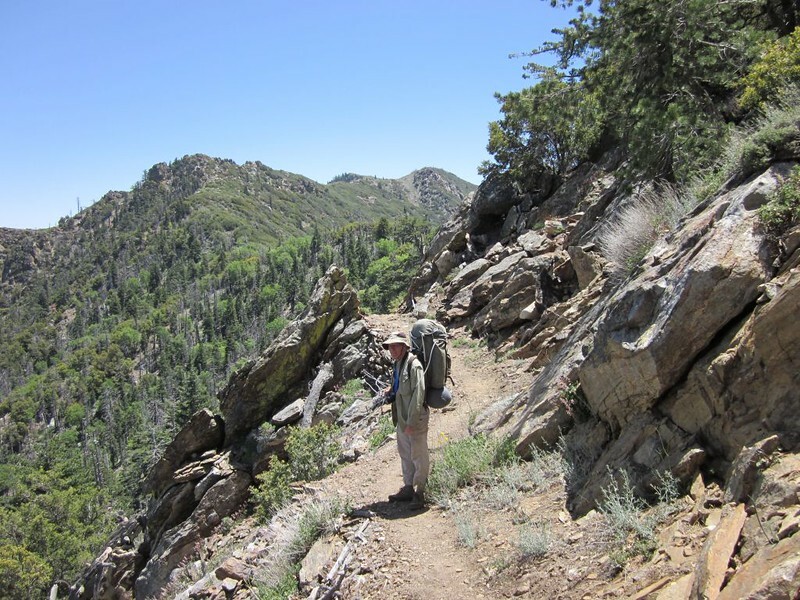 The ridge, or saddle, between Spitler and Apache was excellent, as the trail wound along directly on the crest. There were views in all directions from this prime location, and we took many photos. Soon the next phase of the hike began: Climbing up and around Apache Peak. This mountain had two summits (one being the “true” summit), but we didn’t visit either. 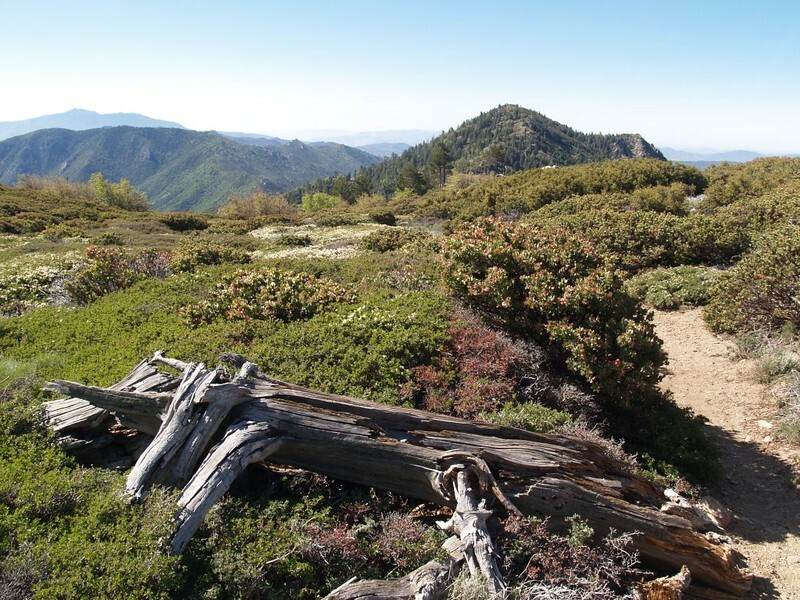 There were no large trees here, except old dead trunks, as this peak had burned back in 2007. We took a rest here, and ate some snack. There were fine views all around. 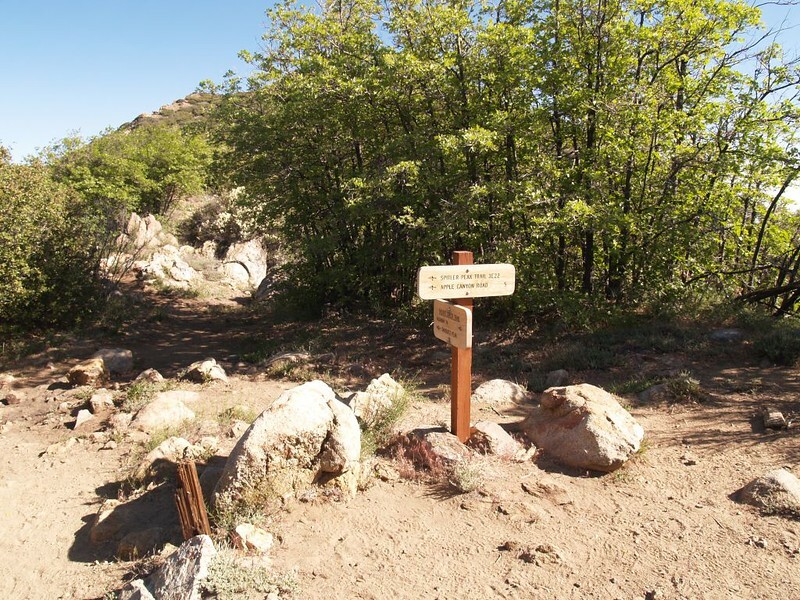 We passed the sign for the side trail down to Apache Spring, on which a paper note was pinned which stated “No Water”. No water! This was quite a shocker to us, as we had originally planned to camp here on our third night! We were mighty glad that we had changed our plans and hiked the extra distance on our first day. 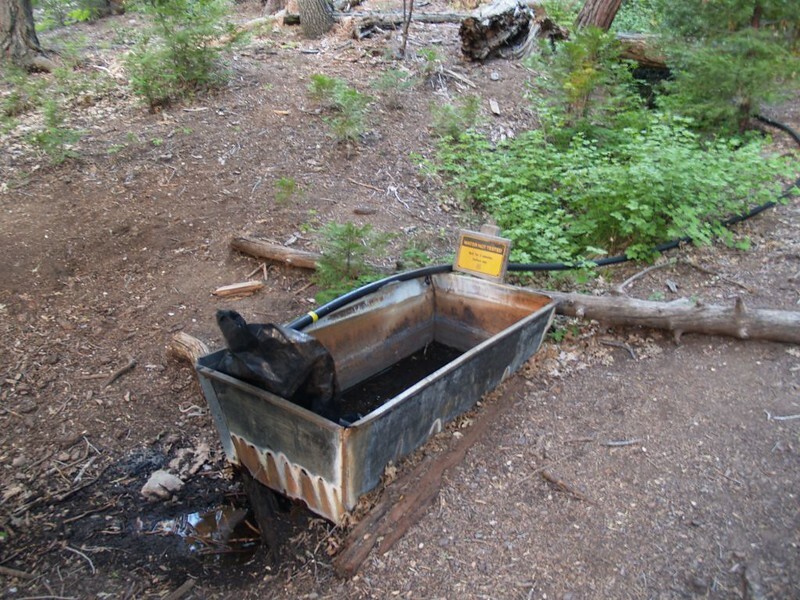 The PCT Water Report had mentioned that the water was low, and that it had a sulfurous taste, but not that it was dry. 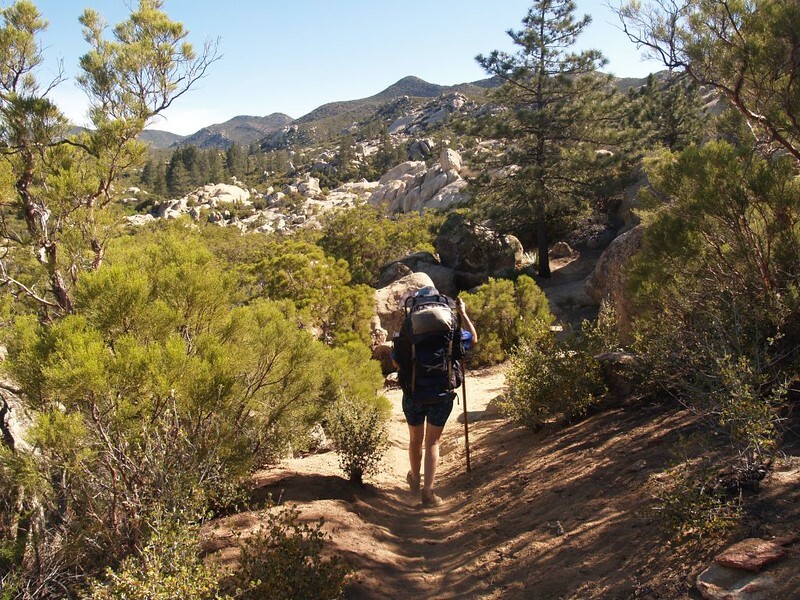 Let that be a lesson to anyone who hikes the Pacific Crest Trail in Southern California! 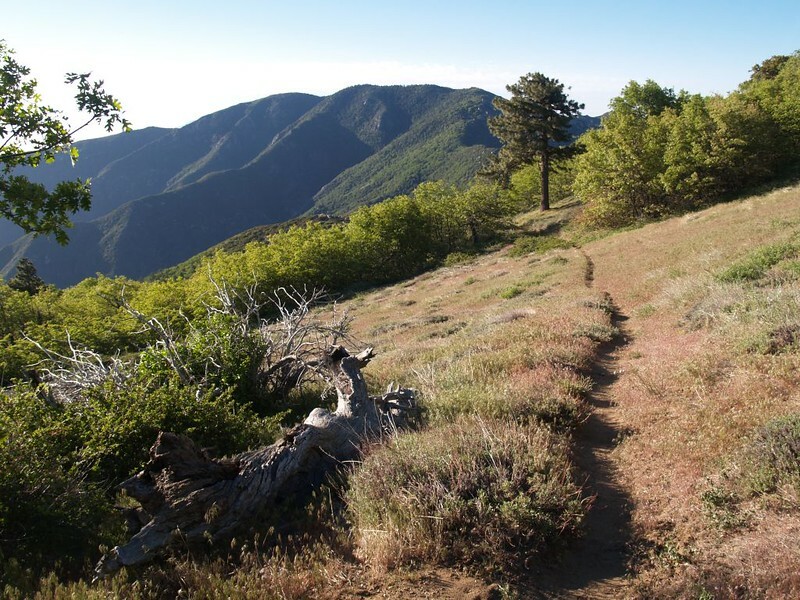 The trail then traversed around the east side of Apache Peak, where we were treated with fine views off into the desert. 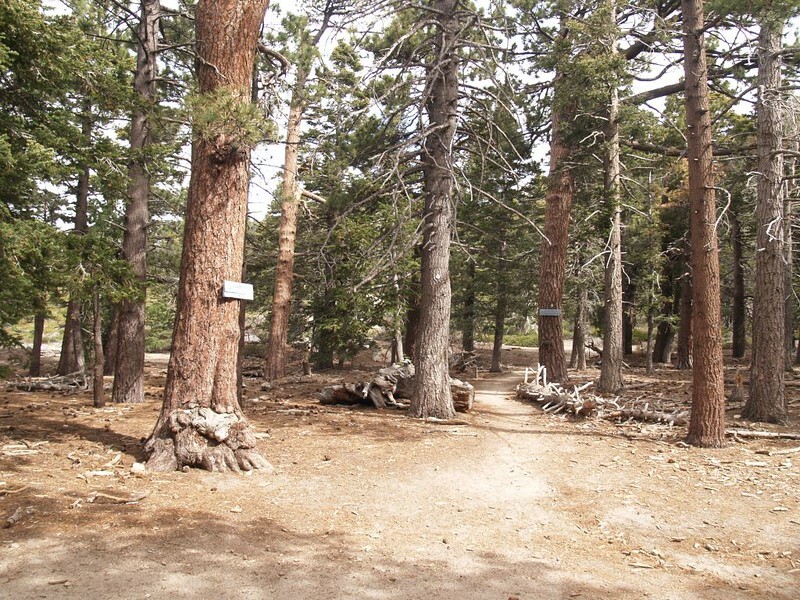 We also discovered a small stand of pines which hadn’t burned in the previous fire. It was nice to stop in their shade, as it was getting rather hot in the sun by this point. 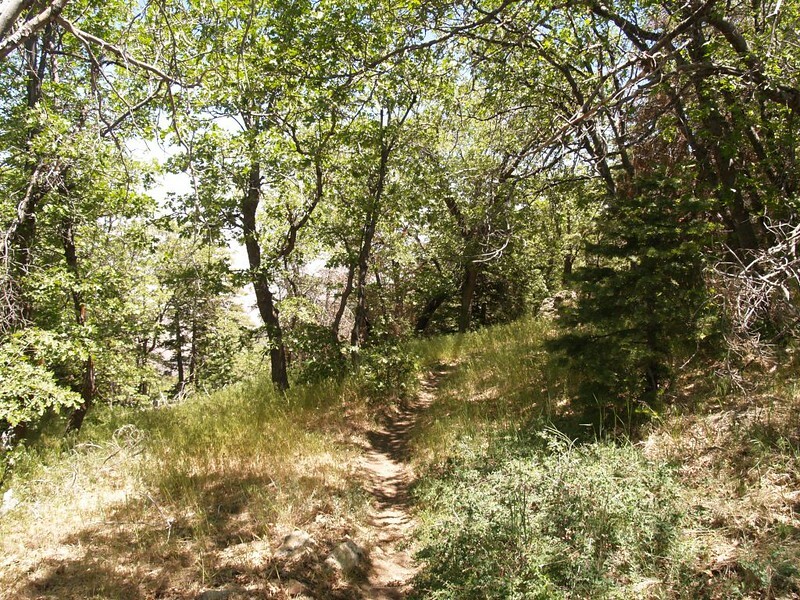 We hiked onward toward Apple Saddle, which was wooded and shady. We discovered the hiding spot behind a fallen tree where our benefactor Hal Summers had left three gallons of water for us. Hallelujah! He had carried them up there partly for exercise, but mainly to help us, as there was a short day-hiking trail climbing up to the saddle from the west. Then Vicki found a comfy spot to take a nap. Too bad for Vicki that someone else had already used it to take a dump! And didn’t bury it! Disgusting! Vicki ended up with a foul smelling bandanna (and some of her clothing!) and never did get any sleeping time. Sad but true. Of course, this was partly because Hikin’ Jim and his buds showed up. We decided to have some lunch together. 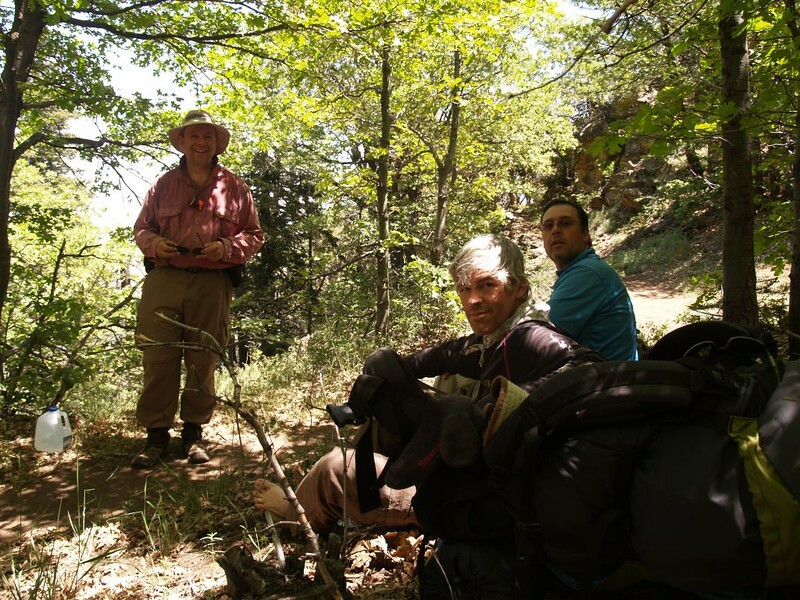 They told us about their bushwhacking and peak bagging escapades, making us glad that we hadn’t bothered. That was hard work! Then we split the three gallons of water between us. This was one of those rare times when making ones pack heavier is a wonderful thing. The trail stayed level as we traversed to the east of Antsell Rock, but soon enough it began to climb in earnest. We had to gain the crest once more, and there was only one way to do it: Switchbacks. On the first half of our hike we had climbed over 1400 feet only to descend back down 600 or so to Apple Saddle. 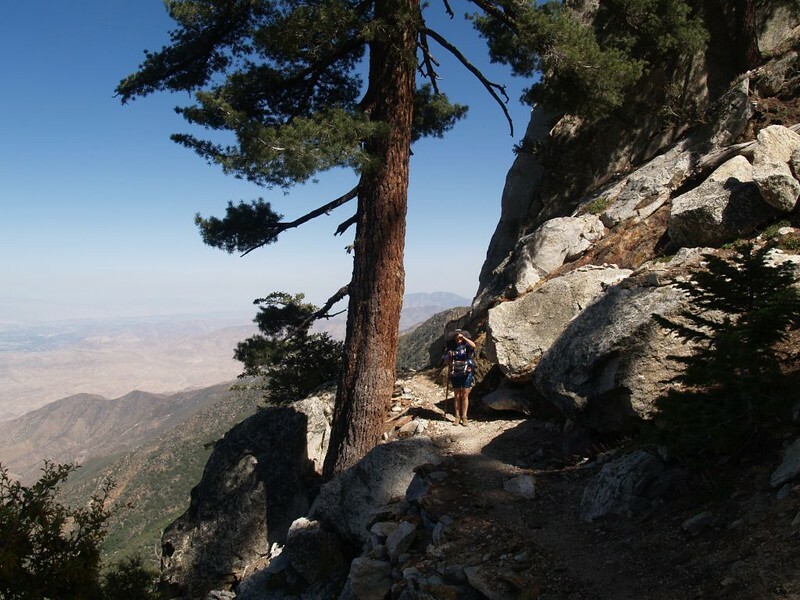 Now we had another 1200 feet to climb to reach our campsite at PCT mile 175. Vicki would not have been amused, had I told her how much climbing we had in store. She really doesn’t like the “UP” word. She only knew that it climbed on and on and on. But I was perfectly happy with the trail, as the views were truly incredible. This was the prettiest section of trail thus far, and I took way too many pictures, as usual. 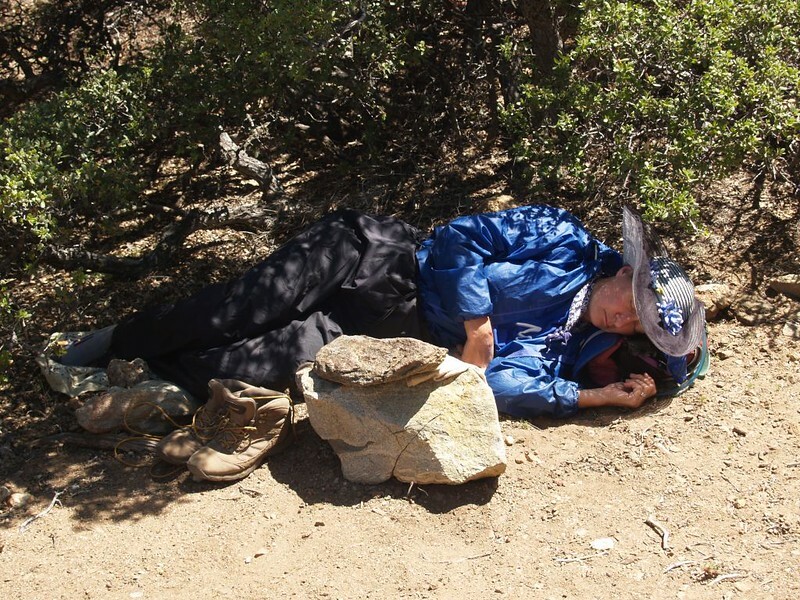 The only way to keep Vicki moving, as we had discovered on previous hikes, was to let her take naps every so often. The problem with this plan was that she, herself, never really knew when she needed one. She would be hiking along, her body slowly depleting itself of energy, until she became a walking zombie. She kept moving only because she didn’t realize that she could (or should) stop for a rest. It was Willpower, of a sort. It was my job to notice this zombification effect, and to act on it. That’s when I would keep my eye out for a nice place to stop, preferably with a view. Then Vicki would lie down and sleep for about twenty minutes or so. This was usually enough time to recharge her batteries. If she wasn’t totally exhausted I would get her to eat something, typically some starchy salty snack, prior to sleeping, so that the nutrients had a chance to work their magic. Then we’d start the process all over again. As the day wore on, the intervals between naps grew shorter, because, let’s face it, a short rest can only do so much. Soon enough we were climbing up the ridgeline to South Peak, higher than we’d ever been this entire trip. The chaparral was long gone at this altitude. We were entering the zone of pine forest. 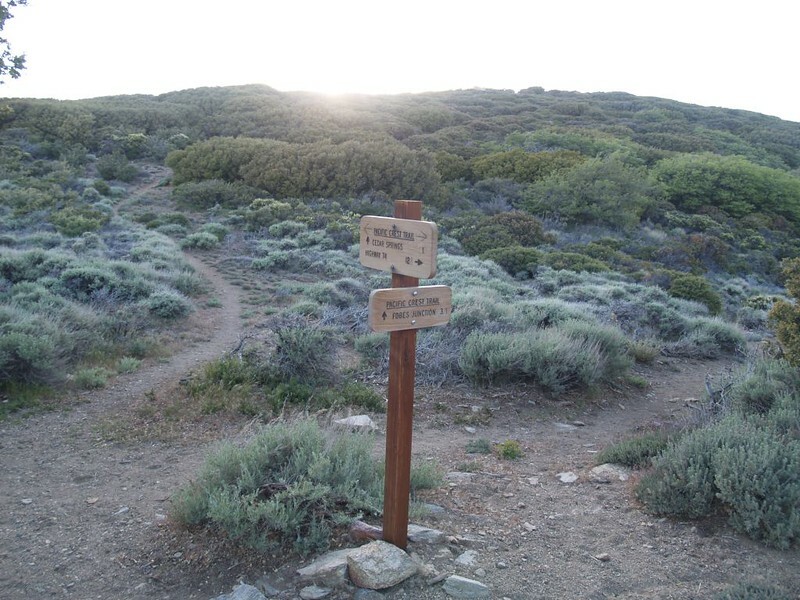 And the trail was beautiful, with views alternating between east and west as we switchbacked up the mountainside. 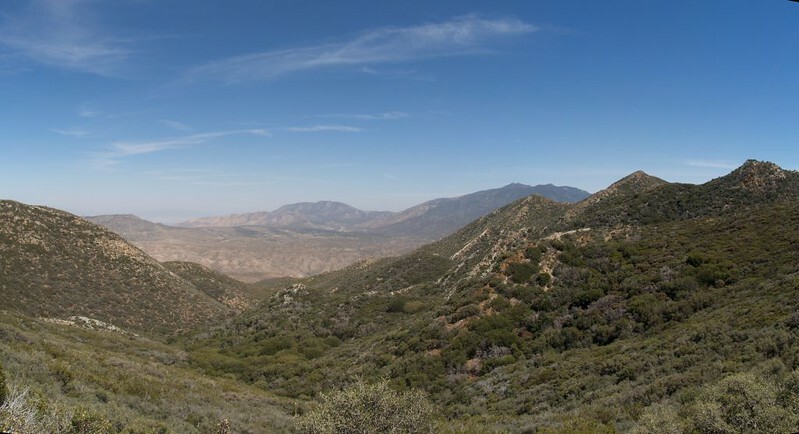 Climbing the south ridge of South Peak (Southwell), elevation 7840 feet, looking southeast over the desert. The trail to South Peak seemed to take forever, as it alternated from east to west. Along the way we’d passed a full backpack just off the trail, on a pleasant spot with a nice view. We were wondering whose it was, but we left it alone. We stopped there and got out the stove. Vicki was in need of sustenance. We cooked up some ramen noodles and she ate them while I ate some chips and read my book. It was a great place to rest. All too soon we had to keep climbing. The afternoon was waning, and the shadows were getting long. Eventually we made it to the point where the path traversed around South Peak, just shy of the summit. We were in no condition to climb the final 200 feet to the top; we’d leave that for Hikin’ Jim and his cohorts. Hiking along the east side, Vicki was grateful to finally be in the cool shade. 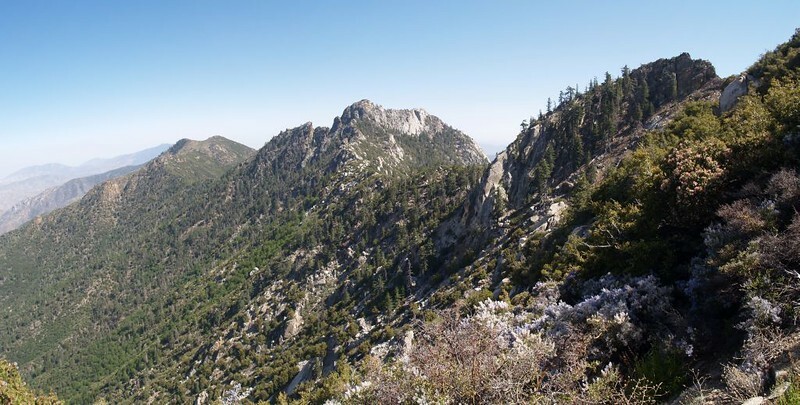 We descended a small amount to the sharp ridgeline connecting South Peak and Red Tahquitz. The original trail builders did a fantastic job here, as we hiked on a path which had obviously been blasted out of solid granite. There were steep drop-offs to either side, and the afternoon breeze was blowing strong, onshore toward the desert. 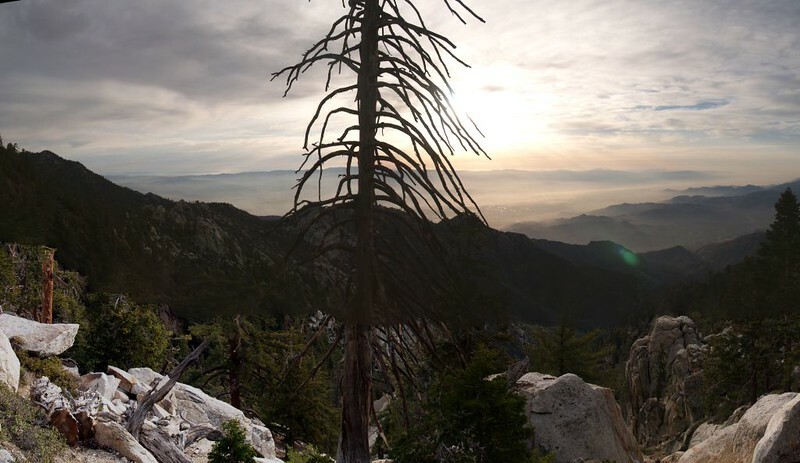 We wondered what it would be like to be a tree in wintertime on this lonely exposed ridge. 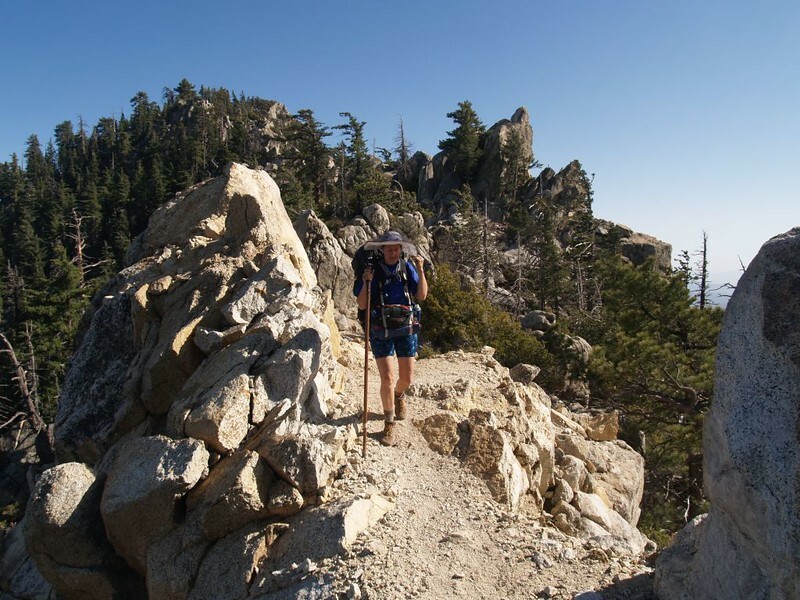 Vicki holding onto her hat as we traverse the sharp ridge between South Peak and Red Tahquitz, with steep drop-offs on either side. We took yet another rest/nap just beyond the windy section. 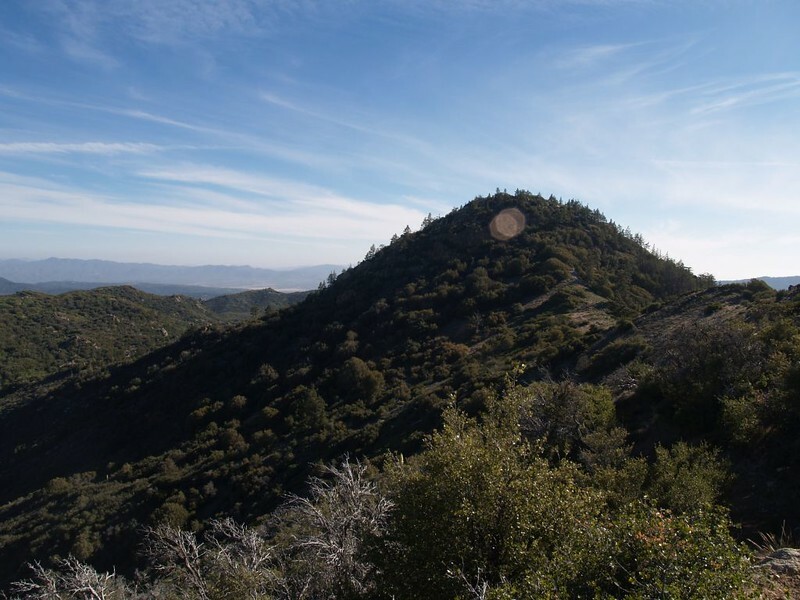 We had nearly two miles to go, and another 700 feet to climb, and the afternoon was drawing toward evening. I was getting a bit nervous, but there was no rushing an exhausted Vicki. Vicki really wanted to camp right here, but it was absolutely impossible, as the only flat spot was directly on the trail, and it would only fit one of us. 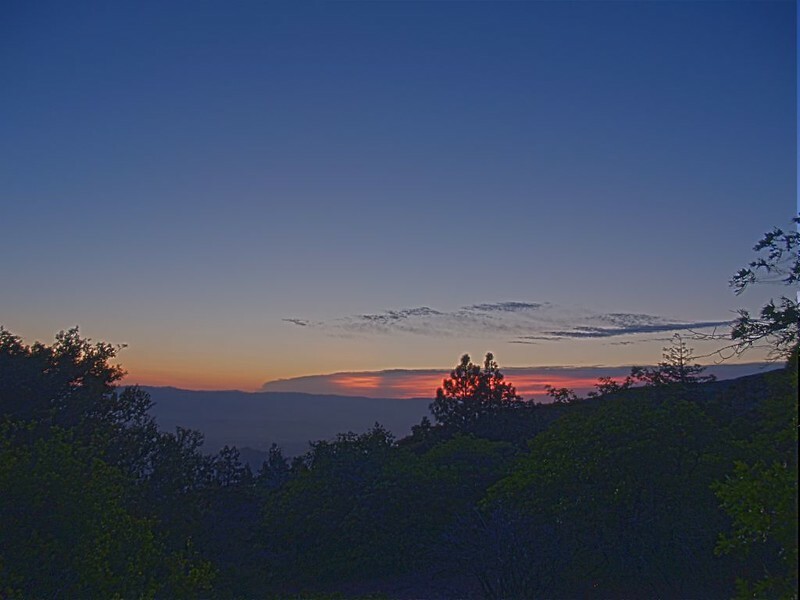 So I reconciled myself to a possible night hike. We had our headlamps, so we would be OK. When Vicki woke up, I also added her water and her pack’s top section to my pack. 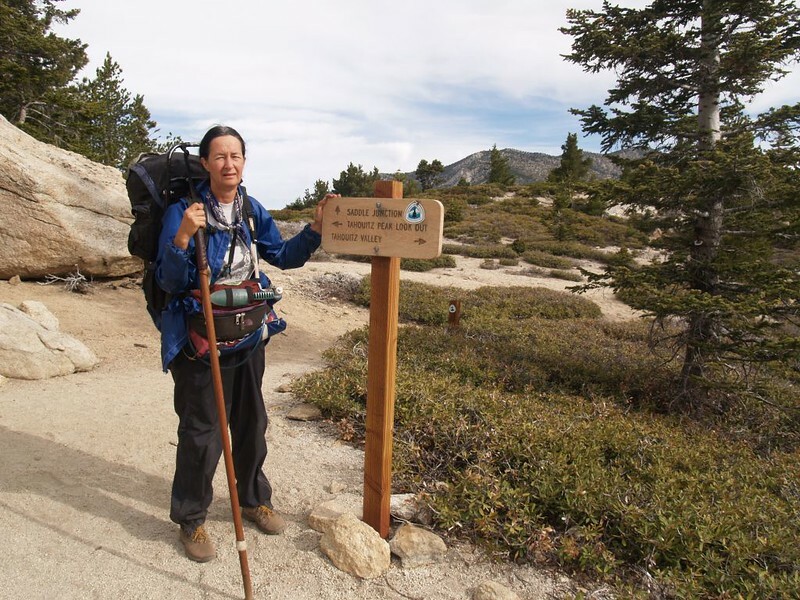 My pack became brutally heavy, but I didn’t care, as long as Vicki could continue hiking. We hiked onward slowly. This was one of the longest two miles we’d ever hiked. Even naps couldn’t prevent Vicki from becoming a zombie. But on she hiked, slower and slower, as the distance between her steps became shorter and shorter. 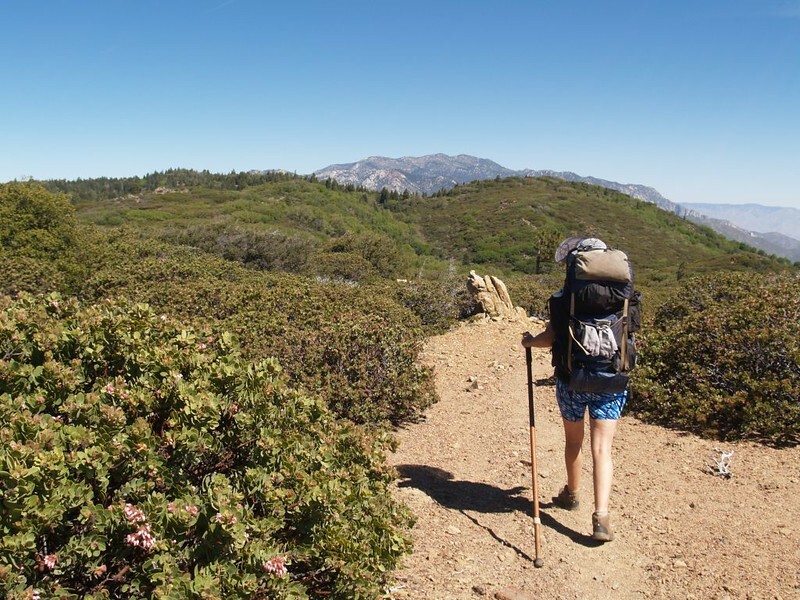 When my GPS informed me that the campsite was a less than a half mile ahead, I told Vicki that I would be back soon, and hiked rapidly onward. I have long legs, and I can cover some serious distance when I want to. And that’s what I did. 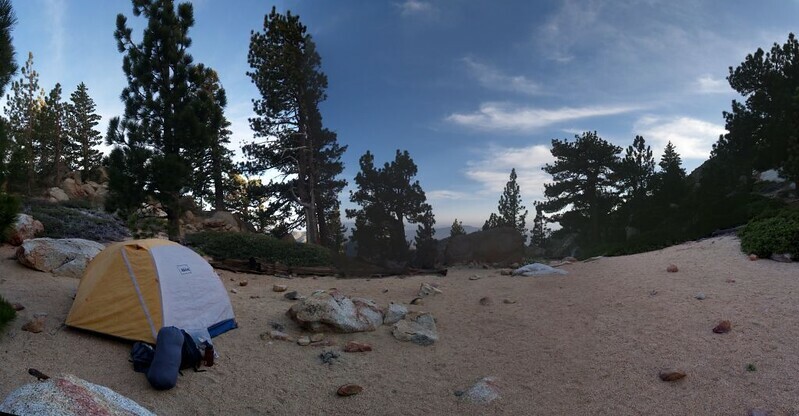 I found the campsite, a wonderful spot with expansive views, big trees, and soft, deep sand. I dropped my pack and hustled back down the trail to Vicki. She was still hiking, but very slowly. She was more than happy to let me carry her pack on this last steep uphill section. She made much better time after that, and we arrived in camp just before sunset. Hooray! Vicki collapsed on the sand as I set up the tent. She was toast. I blew up the air mattresses and deployed the sleeping bag, then coaxed Vicki into the tent. If anyone deserved a nap on this trail it was Vicki. I got out the stove and boiled some water for dinner. Thanks to Hal, we had plenty, enough for breakfast the next morning as well, and a bit more to get us on to the next water source in the Tahquitz Valley. We ate dinner as the sun went down and we retired into our tent. It was great to have a full stomach after a long day of hiking, knowing that tomorrow would be a much easier day. I was reading in bed by headlamp when I heard some footsteps on the trail. Someone was hiking in the dark! “Hello!” I said, my voice loud in the quiet night. “John?” a voice replied. It was Hikin’ Jim! We thought he was ahead of us! It must have been his pack we’d found earlier. But what about his partners? I put on extra clothes and boots and went out to see him. 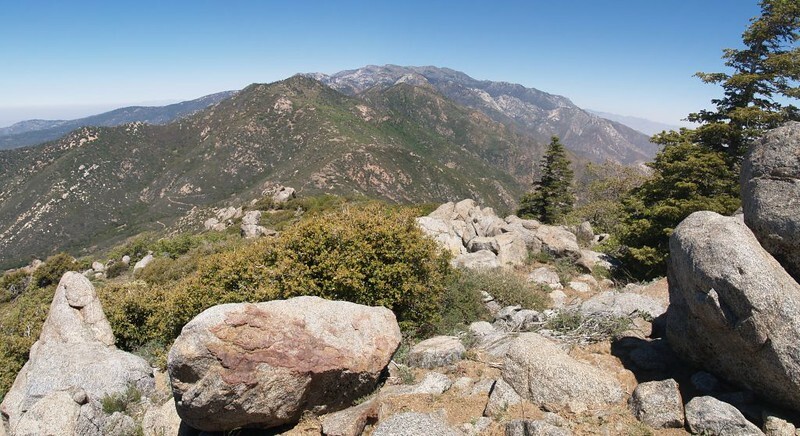 It turned out that Will and Kevin had continued onward to the Tahquitz Valley, while Jim stopped to bag Antsell Rock, a difficult climb that had taken him far longer than he’d anticipated. But he’d hiked long enough for one day. 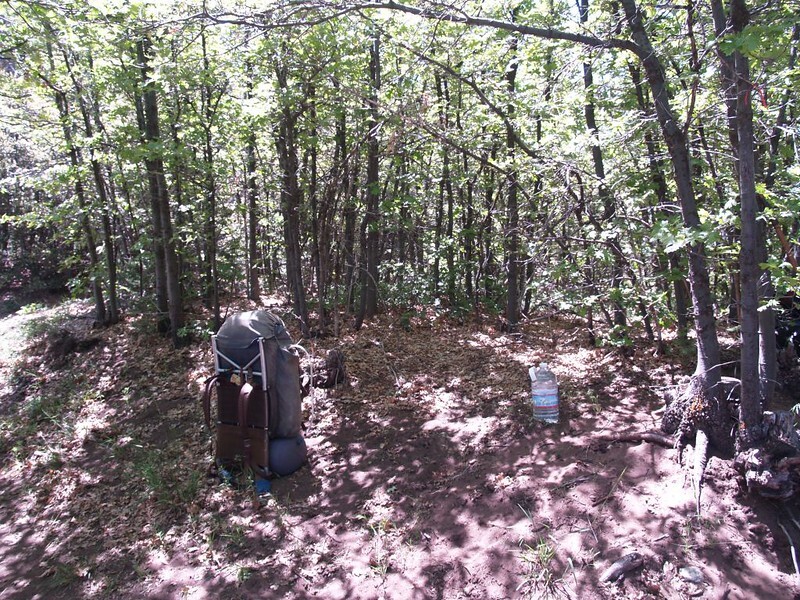 He found a nice spot for a bivouac, and set up his simple camp. We talked while he ate some food, and I gave him some of our water, as he’d been travelling light. And then we went to sleep. We woke the next day before the crack of dawn. We wanted to get moving, to get some more water and get back to civilization. There were eggs and cheese and chips and hamburgers and other wonderfully salty things to eat out there. We ate breakfast, then packed up our gear and got ready to go. We still had over six miles to hike, so we wanted to get moving. Luckily, most of it was downhill, especially the final 2000 feet down to the car, but we also knew that the highest point of the trail was yet to come. 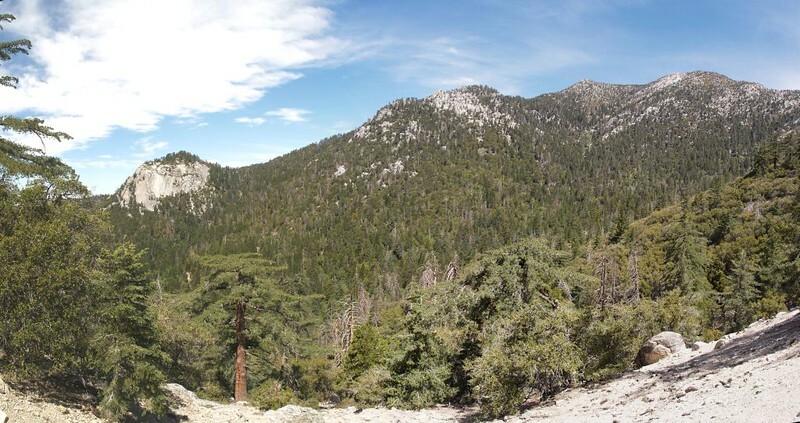 The trail led us up and over the ridge and down into the Tahquitz Valley, a wide area filled with giant pines and meadows. Amazingly enough, we beat Hikin’ Jim to the campsite where Kevin and Will had spent the night. But this was mainly due to the fact that he’s extremely sociable and had stopped to chat with another hiker we’d met. They were relieved to know that Jim was all right, and would be arriving soon. In fact, they had been thinking about how much longer they should wait before heading back to search for him. And they weren’t surprised at all that he’d stopped to talk up a storm. They were used to that behavior! Vicki and I filtered some water from the nearby stream and hiked onward. 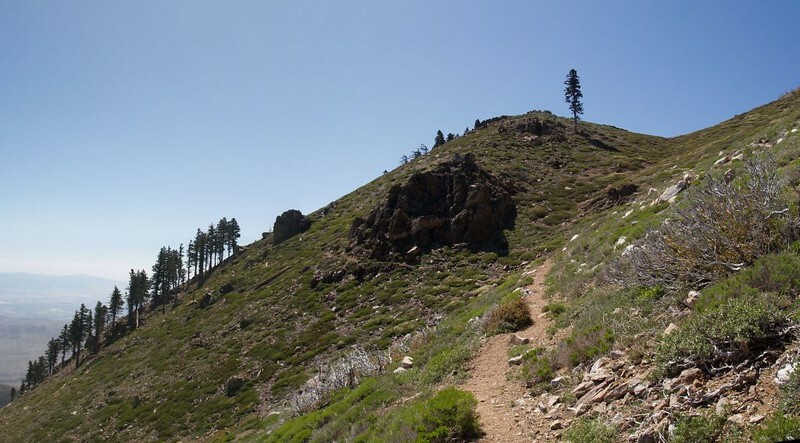 The other three intended to take the shortest path back to Saddle Juntion, but Vicki and I wanted to stay on the PCT the entire way. 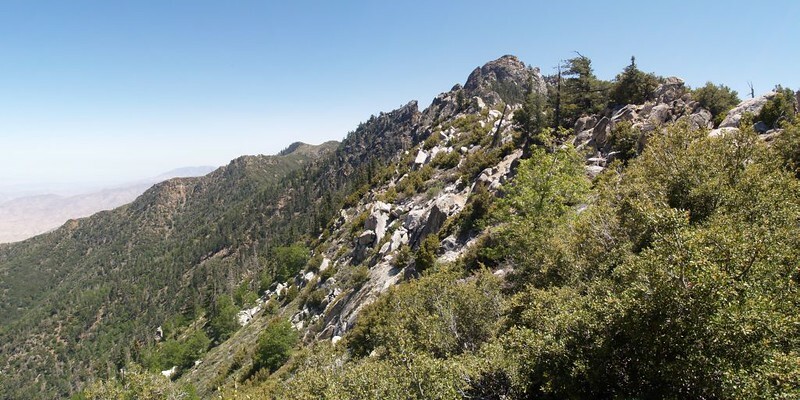 Unfortunately for Vicki, this meant hiking uphill toward the intersection with the Tahquitz Peak trail, for about 400 feet of elevation gain. The views from there, however, were well worth it. 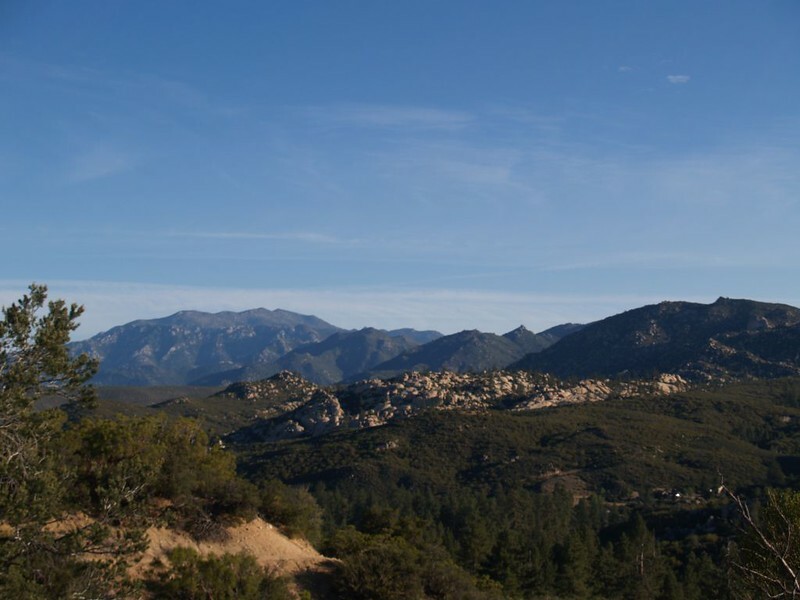 We were able to see down toward Idyllwild, where our car was parked. 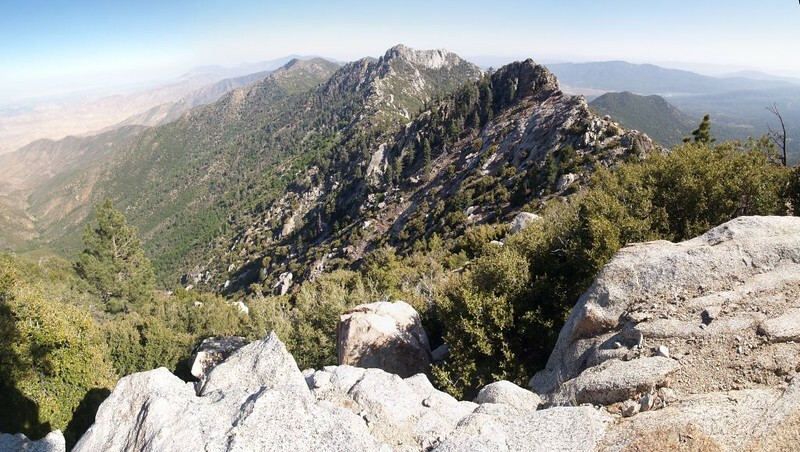 We saw Lily Rock below us, Suicide Rock across the valley, and were able to view the big peaks to the north, Marion Mountain and San Jacinto Peak, both of which are above 10,000 feet. After a nice nap at the high point, it was time to get the big descent underway. 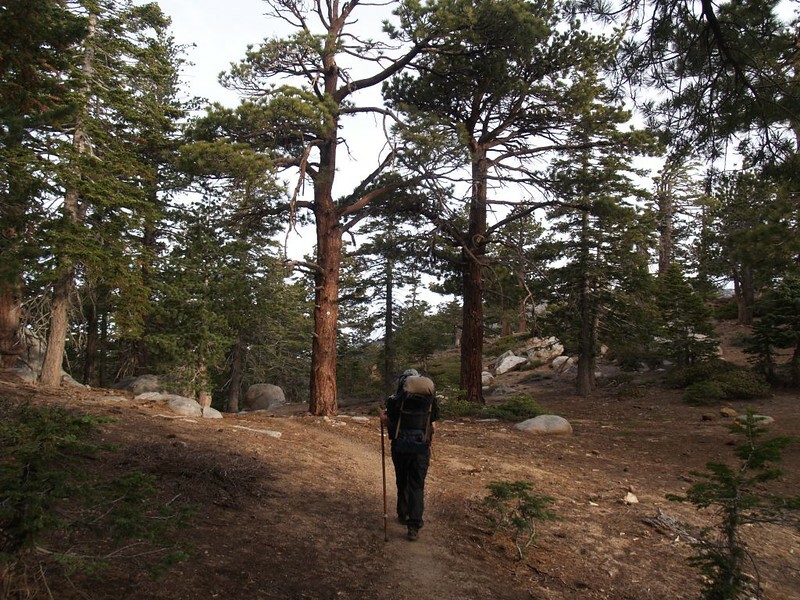 We traveled through the tall pine country on our way to Saddle Junction, where we planned to leave the PCT. 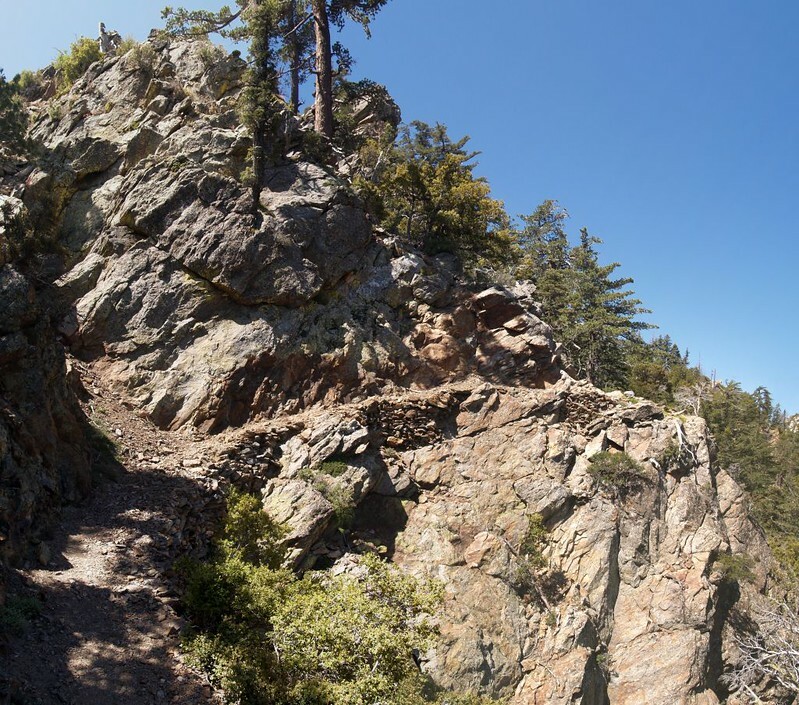 We’d be taking the Devil’s Slide Trail down to Humber Park in Idyllwild. Our car was parked down there, waiting patiently for us to arrive. After a brief rest at the saddle, with our boots off to dry out our socks and cool off our feet, we tightened up the laces to prepare for some serious downhill. Lots of switchbacks on that trail, which wound back and forth across an extremely steep slope. 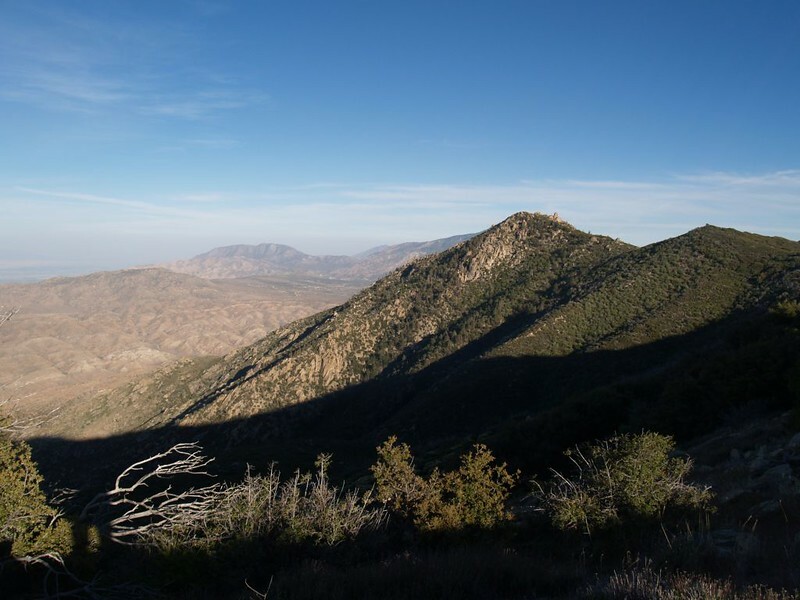 There were several excellent viewpoints along the way, and we took advantage of them, remembering other hikes we’d taken in this beautiful wilderness area. When we made it to the car only Hikin’ Jim was there. 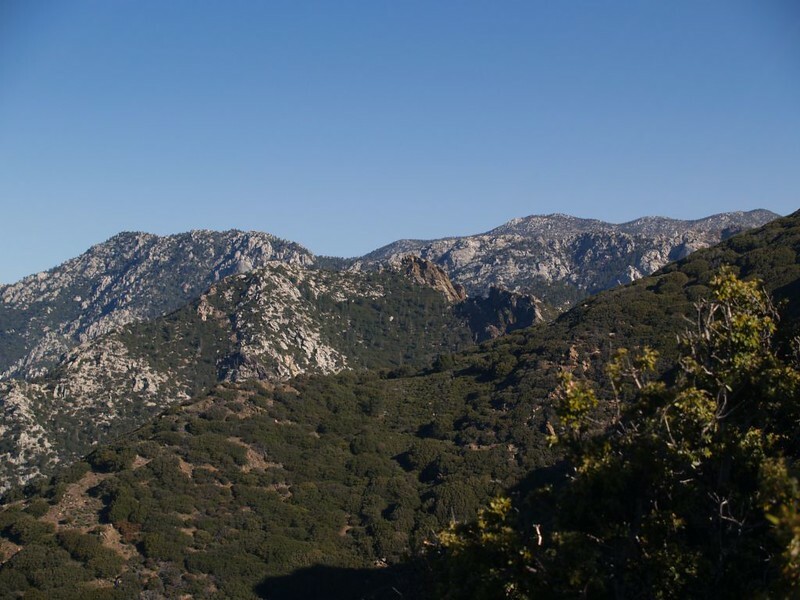 His two partners had gotten rides down into Idyllwild with some other hikers they’d met. The plan was that we would all meet at the Cafe Aroma and have some lunch. But when we got to the cafe, his friends were gone! They must have gotten confused. Meanwhile, none of them had turned on their cell phones. So we gave up on that idea and the three of us had lunch together. I had a big cheesy omelette and Jim ordered “whichever item has the most calories” which turned out to be some sort of chile cheese platter with hotdogs. 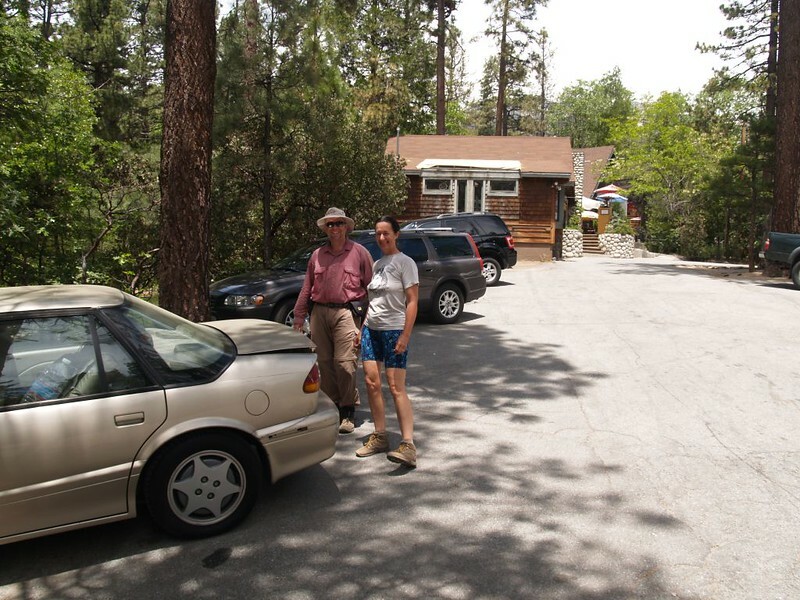 After that, we drove Jim back toward the trailhead on Highway 74 and dropped him off at Hal’s uncle’s house, where he’d left his car. 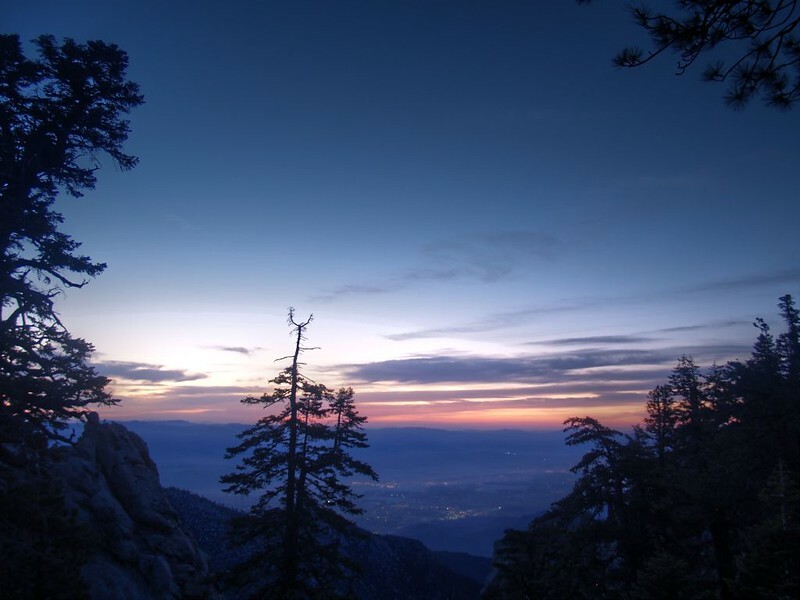 He’d head back to Idyllwild and find his friends by himself. We bid him a fond goodbye and drove home, tired but happy. 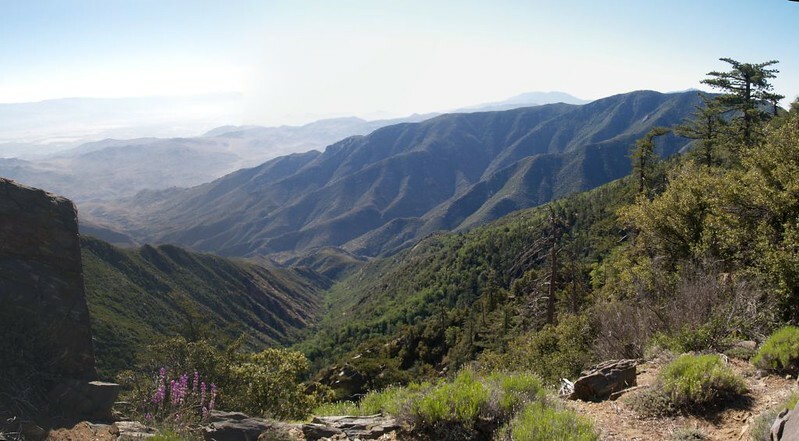 All in all, it had been an excellent hike on one of the most beautiful stretches of the PCT in Southern California. Highly recommended. But if/when I do it again, I think that we might start at the higher end instead, for a net downhill hike. We’ll still have a restful hike, but maybe not as slow. You can view the rest of my photos on my Flickr Album Page. You can view an interactive topo map showing our GPS tracks and waypoints on my Caltopo Page.